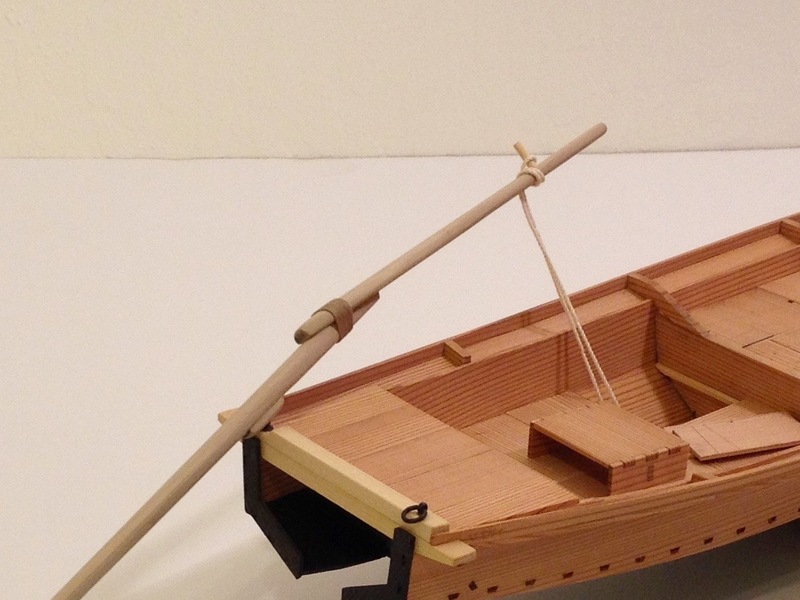 The Tosa Traditional Japanese Boat is a large scale kit of a Japanese one-man fishing boat from the southern Japanese island of Shikoku. The kit is manufactured by a Japanese company called Thermal Studios, whose primary business is the manufacture of large model glider kits. 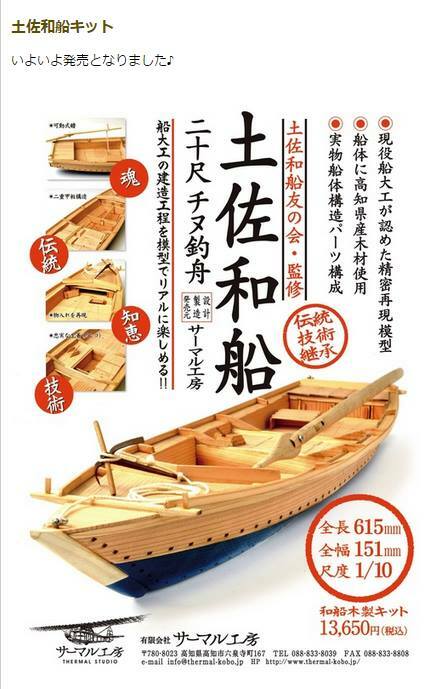 The kit was designed under the supervision of the Tosa Traditional Boat Society, so it is very authentic. If you’re looking to buy the kit, there is good news! There is a faster, less expensive method than trying to get it through Amazon-Japan where I got mine. I found out that manufacturer will sell direct to the USA for a very good price. To buy from the manufacturer, send an email to the company: info@thermal-kobo.jp. For buyers from other countries. I don’t know what his policy is, but you can always ask. Price for the kit is 13,000 Yen. Shipping is via EMS (A Chinese Express Mail Service that ends with a USPS delivery) for 2,400 Yen. Payment has to be via Paypal, sending to the email address above. This is a really good price. Makes the whole thing with express shipping only about $150. I went ahead and ordered a second kit. The only thing that I’m not so sure about is that the kit is shipped in its own box, but wrapped with a bubblewrap bag. It’s a long box, so it seems like it would be easy to bend in half. But, I received the first kit this way and it was delivered just fine. Then again, I generally have good experiences with the US Postal Service here. It looks like I might have been their first international sale of this kit, as the owner posted a picture of the kit shipping out to the USA on their Facebook page. This entry was posted in Ship Modeling News, Tosa Traditional Japanese Boat and tagged Japanese Boat Models, Japanese fishing boat, Thermal Studios, Tosa, Traditional Japanese Boat Building, Wasen on October 18, 2016 by catopower. 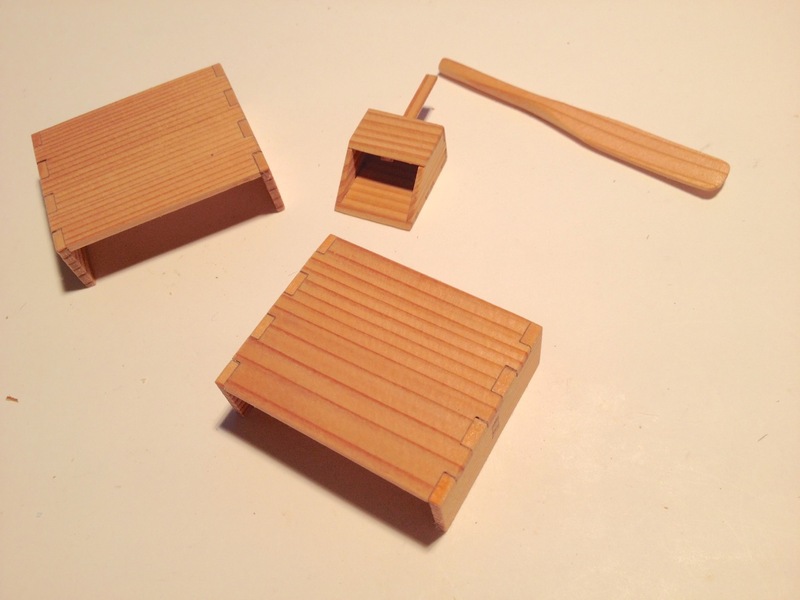 The next step in construction of the Tosa Wasen kit is the addition of the deck boards. This part of the build turned out to be a lot tricker than I’d expected. This is an area where you really want to take your time, and it’s easy to want to rush through it. The deck boards serve as a deck to walk (or sit) on and work on, but they are also designed to be removable, allowing the fisherman access to storage space under the deck. This allows the deck to be kept clear and free of clutter, making for a tidy looking boat. Beam supports glued into place. The beams are sanded to fit, but I left them unglued, so they’ll remain removable. Ledges are then cut to length and glued to the beams for the deck boards to rest upon. The deck boards themselves are rather interesting in that they are made so that almost no two are alike. Each one can only fit in one location, with the possible exception of the boards that cover the live wells in the center of the boat. But, given that there are many boards, it would seem to be something of a puzzle trying to figure out which one fits where. To make the positioning more obvious, there are two lines scribed into the top of the boards. 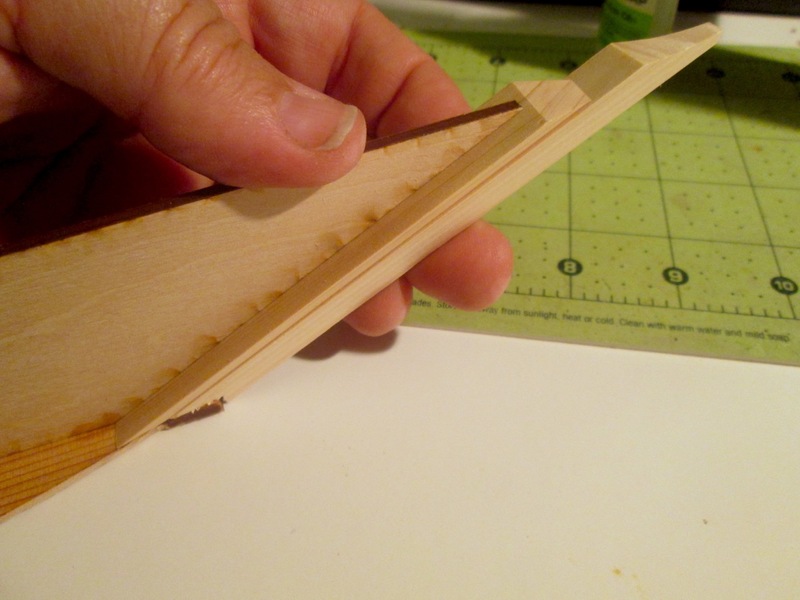 The lines form a sort of an arrowhead with the point at the front of the forward most board, and each compartment has a 3 or more deck boards covering it, with its own arrowhead pattern scribed on it. This makes for a quick recognition of the order of the deck boards and also makes it easier to keep from mixing them up, kind of the way a picture is printed on jigsaw puzzle pieces. 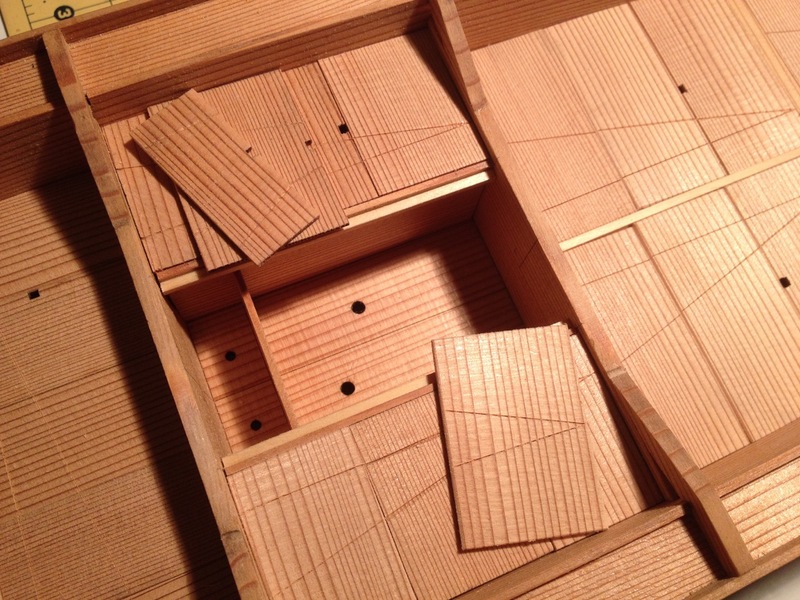 Note that one deck board of each set has a square notch cut into one edge that serves as a finger hole to make it easier to pull up the boards. 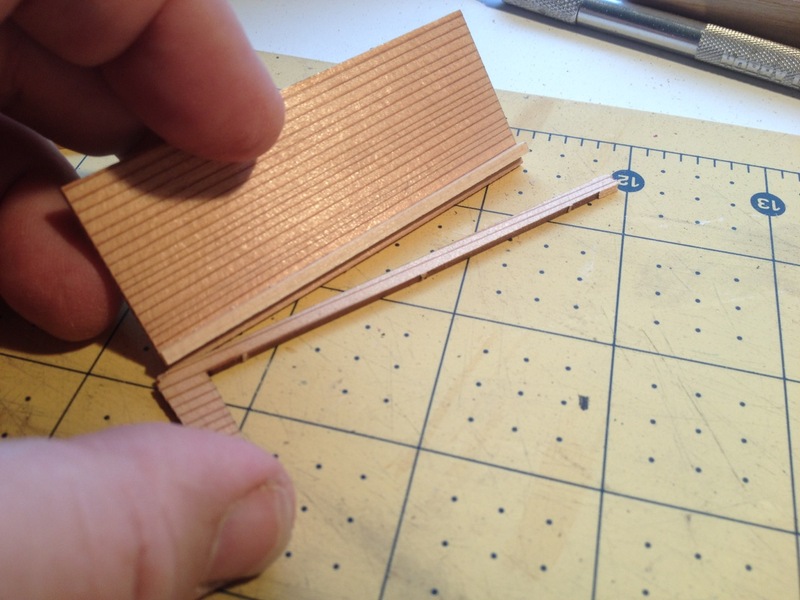 This also makes it easier to pull up the boards on the model using a paperclip or other small tool. Live wells with holes in the bottom of the boat, open to the sea. The large one is for the catch, the small one is for bait. 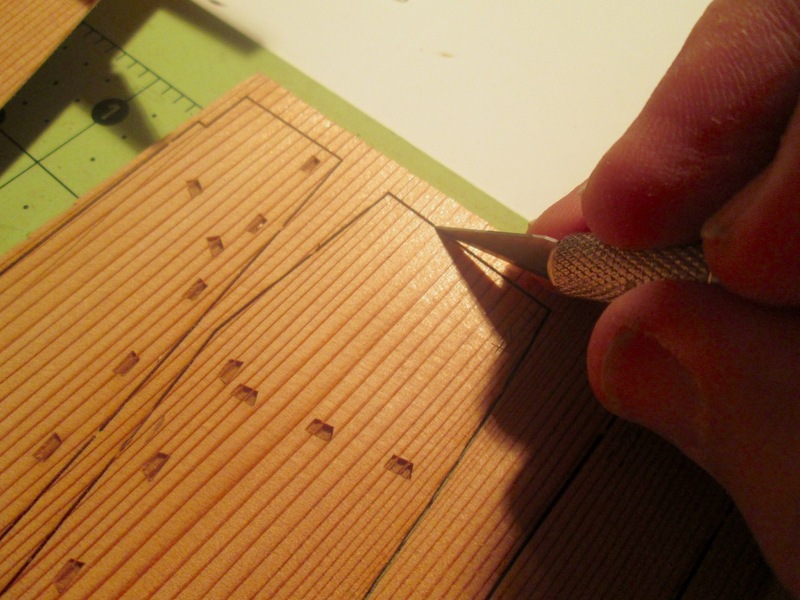 The kit supplies the deck boards as laser-cut pieces, which look they’d make it easy to put them into place. However, in order to allow some variation between models, these parts are cut over-sized, so they have to be sanded to fit. This turned out to be a far trickier than I’d expected, as the Japanese cedar is pretty soft, and really wanted to avoid small gaps between boards. In fact, I used every scrap piece of cedar that I could find in the kit in order to finish the deck boards. If you’re building this kit, Proceed Very Carefully here. The next step was to scribe the patterns into the deck boards. I found it easiest to take each group of deck boards which are part of the same pattern set and marking the endpoints on the first and last board, then scribing them all together as a group. I lined them up against a straight edge to keep them in alignment (each set of boards has at least one straight side). This was pretty much the last of the difficult work. There is one more step that was a little tricky, but in a completely different way, and that was the next step. For those following along with the kit instructions, this is step 33. 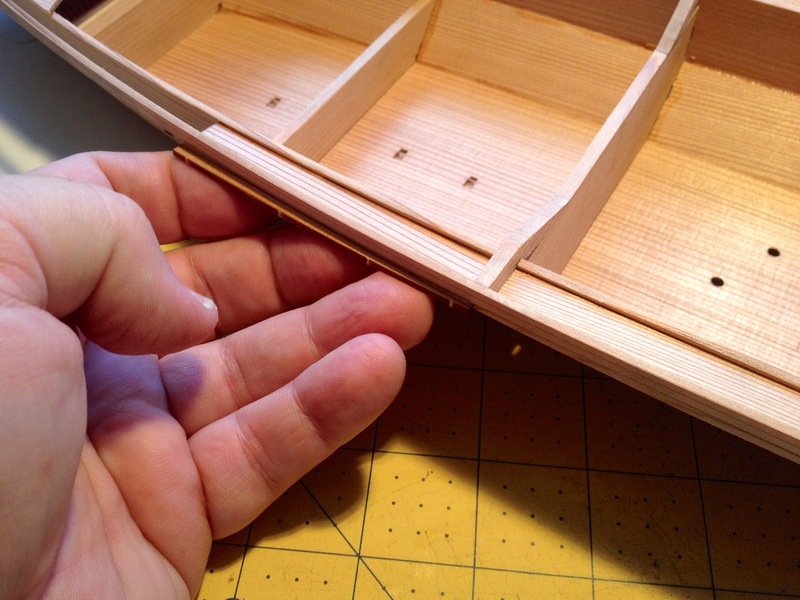 This involves the construction of the covers for the cargo compartments in the bow and the stern of the boat. If you haven’t built the model kit yet, I would consider doing this work in steps 17 and 18 before the compartments are decked over. It seems it would just be a lot easier. I’m not positive why the kit has you build the compartment covers at this stage instead of earlier in the build. 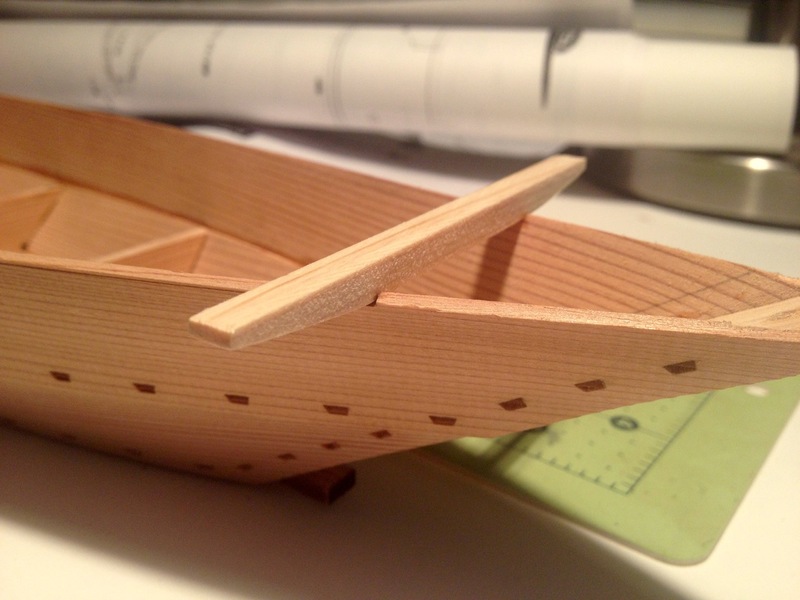 Possibly, it’s because the real boat might be built in the order shown in the kit. That would be okay, except that trying to reach in with your finger and thumb to get the covers into place without knocking parts into the compartments is pretty difficult. 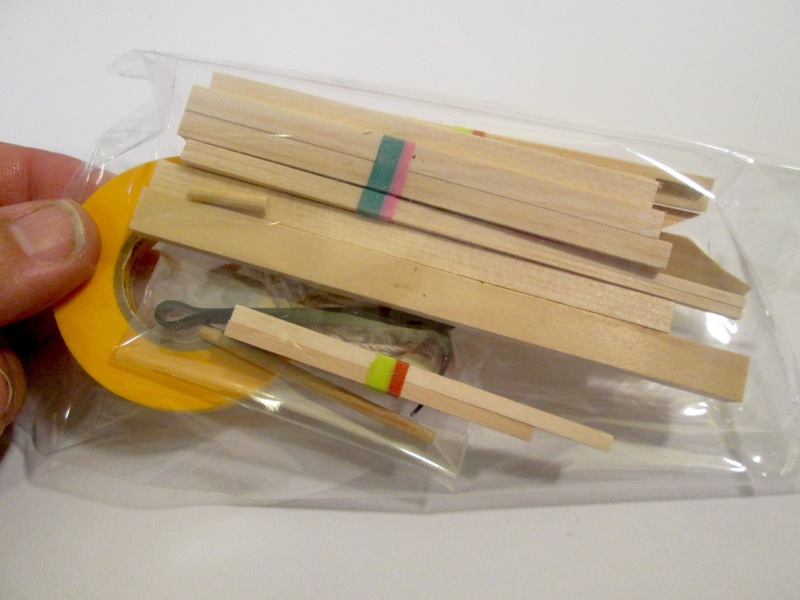 The kit includes a small pair of wooden tweezers that you’re instructed to build for handling those compartment doors. In the long run, these will be necessary in order to be able to remove or replace these doors without damaging the soft wood. 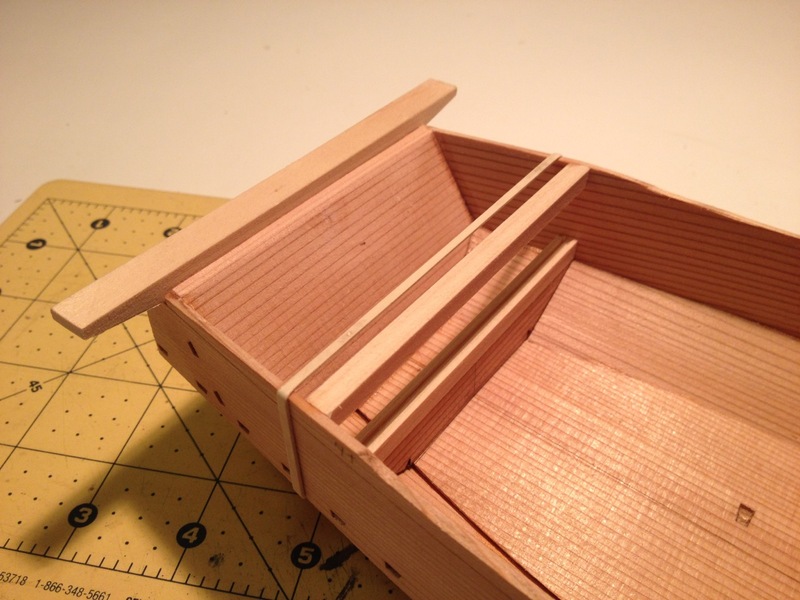 I jumped ahead just a little bit with the compartment covers since I was kind of on a roll with the trickier stuff. So, afterwards, I went back to deal with the rail supports. These are tapered blocks that are added to the rail after it has been constructed. By constructing the rails first, the nice fair curve has already been established and doesn’t need to be engineered into the design. Afterward, the support blocks were added to give the structure more rigidity. You can see the support blocks of the rail in the photo below, and also in the second photo shown above. 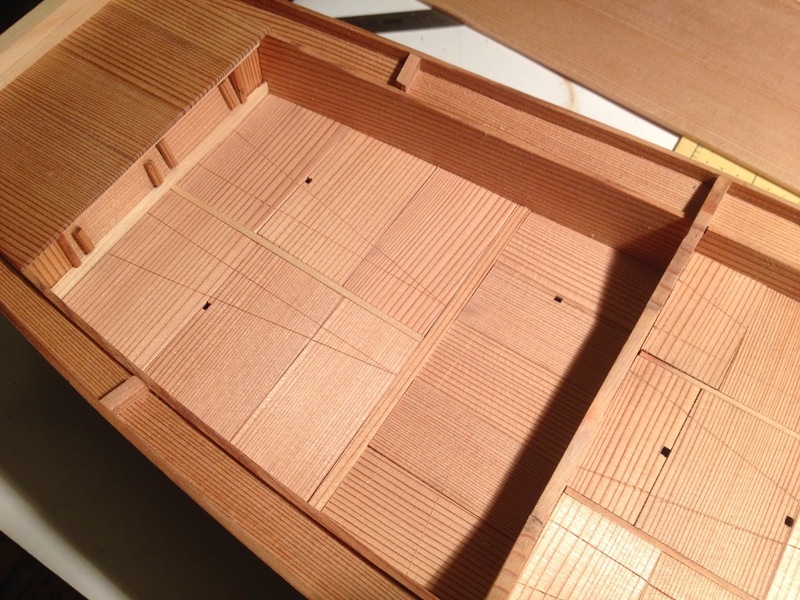 The last steps of the Tosa Wasen kit involve adding the finishing details. These included the rail supports, oar, ringbolts, anchor, oar and some fisherman’s accessories. 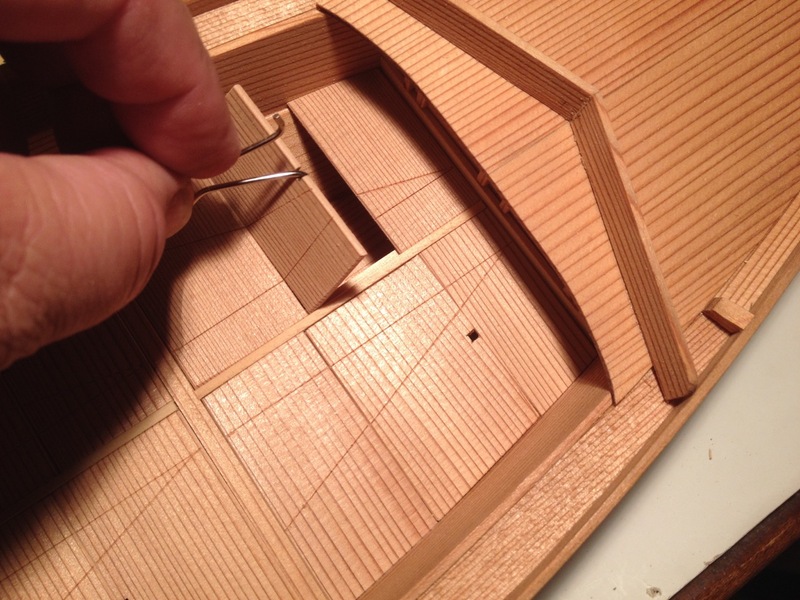 Dealing with the details on the boat first required drilling some 2mm holes to accommodate the ringbolts, etc. Ringbolt and the pin for the sculling oar added to the stern beam. Ringbolt and, for lack of better term, “belaying pins”, which are mounted on the bow beam. The kit includes some accessories that I jumped ahead and worked on because they looked fun and interesting. Specifically, there are two wooden seats, a small hand-paddle, and a bailer for scooping water out of the boat. 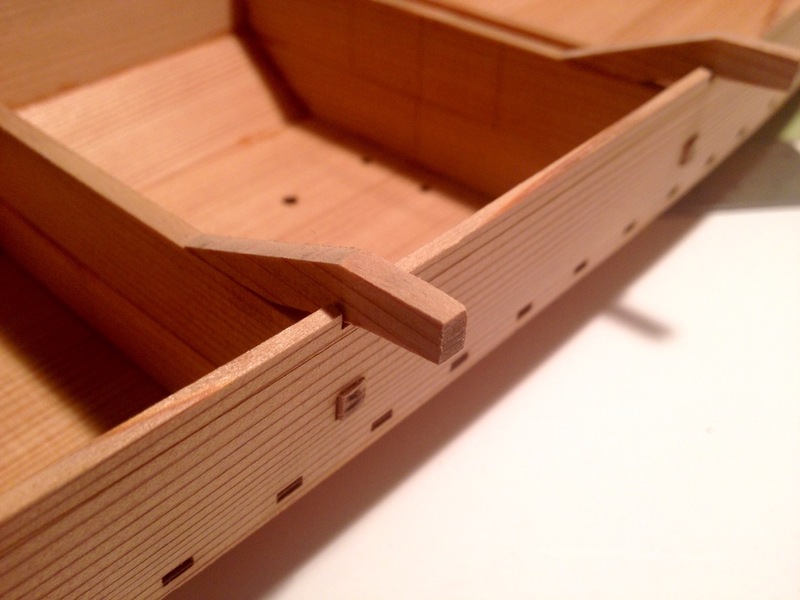 The laser-cut pieces are designed to create nice box joints between all the parts, and as with everything else, the parts go together in a perfect fit. This is true of the bailer as well as the seats. The hand-paddle, called a Tekaki, was the only item here that required any shaping. Everthing else just went together and took a little sanding to soften the edges just a bit. Afterwards, if you don’t want to display them on deck, they fit quite neatly in the storage spaces below the deck. The boat, like most traditional Japanese boats, is propelled by a long, rearward facing sculling oar called a “Ro”. 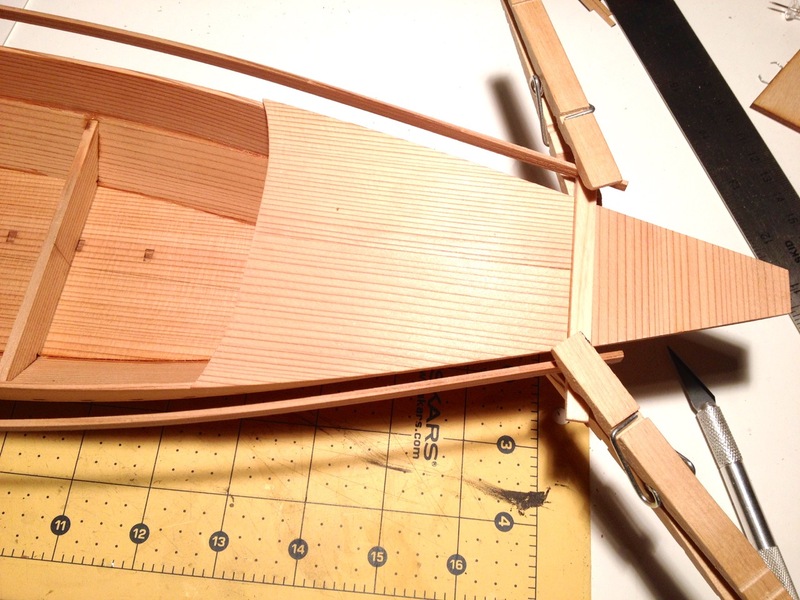 The sculling oar in this kit makes an accurate representation of a Japanese sculling oar. 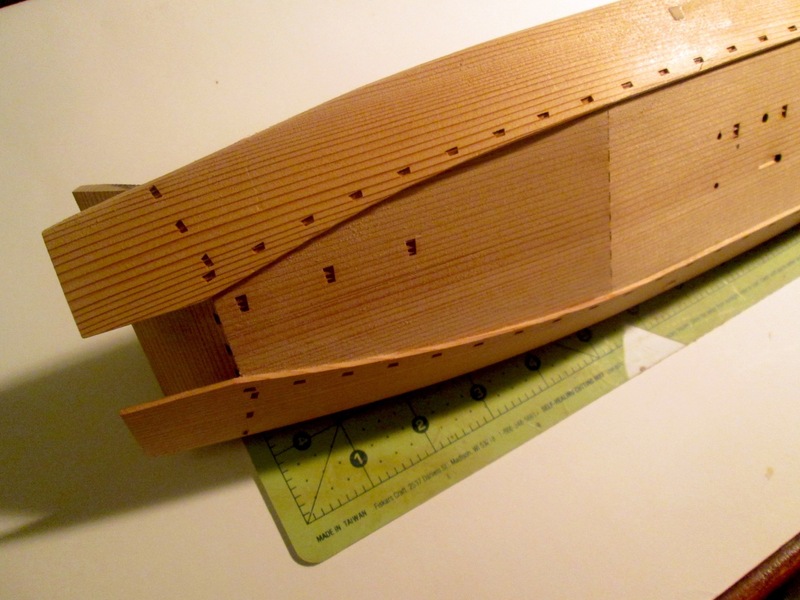 The plans show the cross-section of the oar at different points along its length, and the scale is large enough for people to see the shape detail. 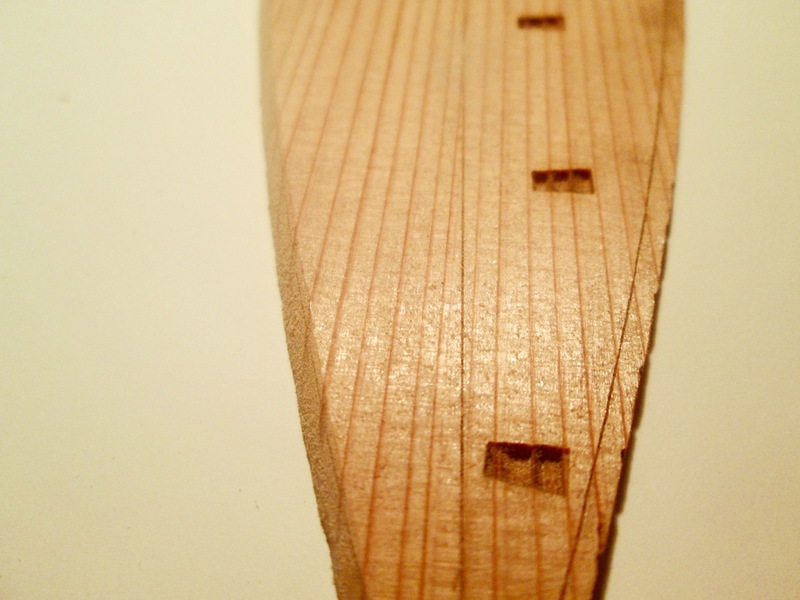 The oar comes in two main pieces where were milled, not laser-cut, from Japanese magnolia, or “Ho”. This is kind of a grayish colored wood with a fairly fine grain that is harder than the cedar or cypress in the kit. I varied a bit from the kit design here in that the kit included a tiny screw and nut to fasten the parts together. This is how the real Ro are made today and for the last 100 years or so. But, going for the Edo period look, I decided to wrap them together with rope instead. The anchor is the last item of this build. Not sure how they form this, but it seems like a piece of cast acrylic. It’s just a ted flexy, but has a good shape to it. It comes a little too thick, so it required some sanding to get it to look a bit more like the photos in the instructions. I ended up speeding up the process by using my belt sander. The part held up well and didn’t melt, so this worked out pretty well. The anchor’s shape has a bit of taper, so it’s thinner at the top than at the bottom. At the base, there is a hole from a cross piece, making it look something like a grappling hook. The hardest part was tying the knots. I tried translating the text with Bing Translate, but all I got was a Japanese name for the knot. However, Google Translate came up with “Bowline”, which made life much easier. Basically, there’s a bowline at the base, a pair of half hitches, and the a separate rope ties the anchor cable to the eye of the anchor. The cable is then fastened to the ringbolt on the stem using a bowline. A short piece of the supplied rope for the anchor cable was needed for the loop that secures the sculling oar. When not in use, that loop of rope stores away nicely under the deck. The finished project turned out beautifully. I used a coat of natural stain to finish it off and seal the wood. According to the label on the Minwax can, it seals, so that should help the longevity of the model as well as bring out some of the color of the wood. I’ll eventually build a case for the model. With not masts, a cased Tosa Wasen model will fit easily in the bookcase. My Wasen Display is still running at the bank in San Francisco’s Japantown, but I have plenty to do with other projects, so I won’t worry about adding this model until Wasen Model Display 4.0 maybe in the Summer. This entry was posted in Ship Model Build Logs, Ship Modeling News, Tosa Traditional Japanese Boat and tagged Japanese Boat Models, Japanese fishing boat, Thermal Studio, Tosa, Traditional Japanese Boat Building, Wasen on January 18, 2016 by catopower. 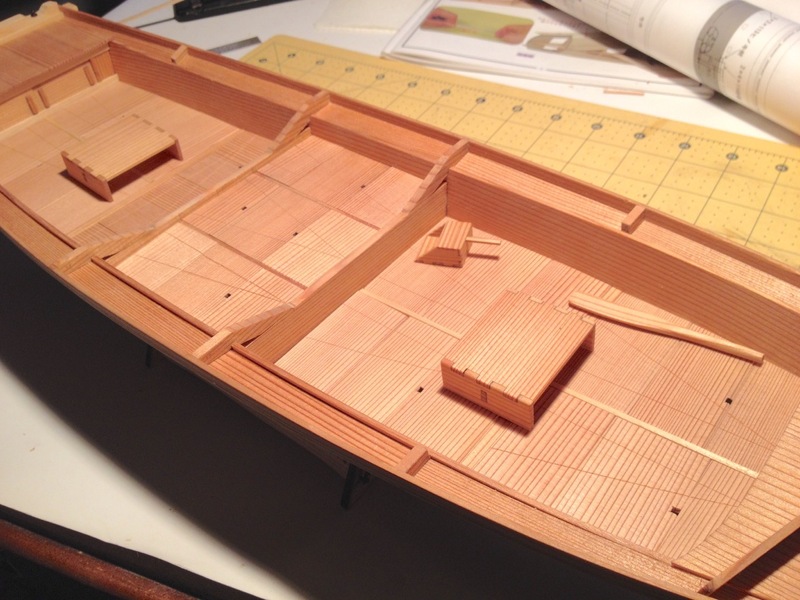 Continuing with the detailing now starting with the bow and stern decks. The bow deck required installation of support beams. 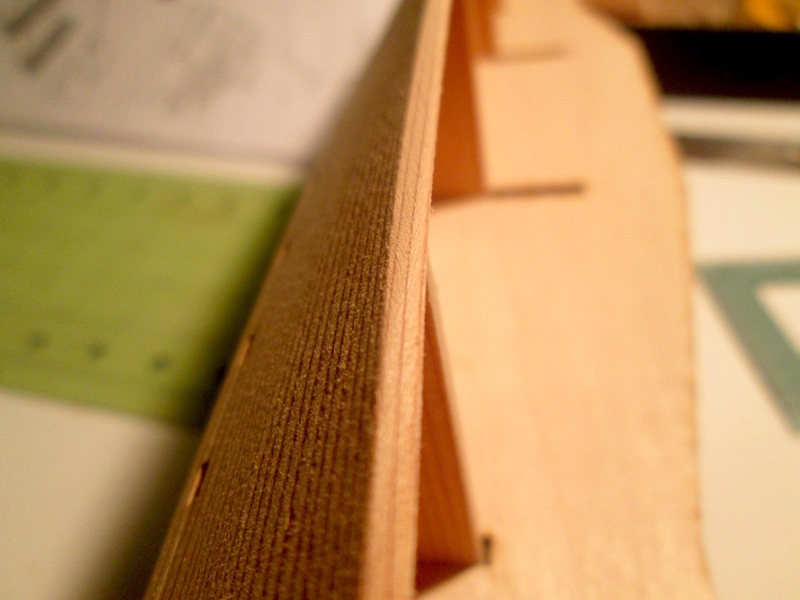 The beams are provided pre-cut, but the ends needed to be tapered to fit snugly against the hull planking. The deck itself is made up of two pre-cut pieces of cedar. 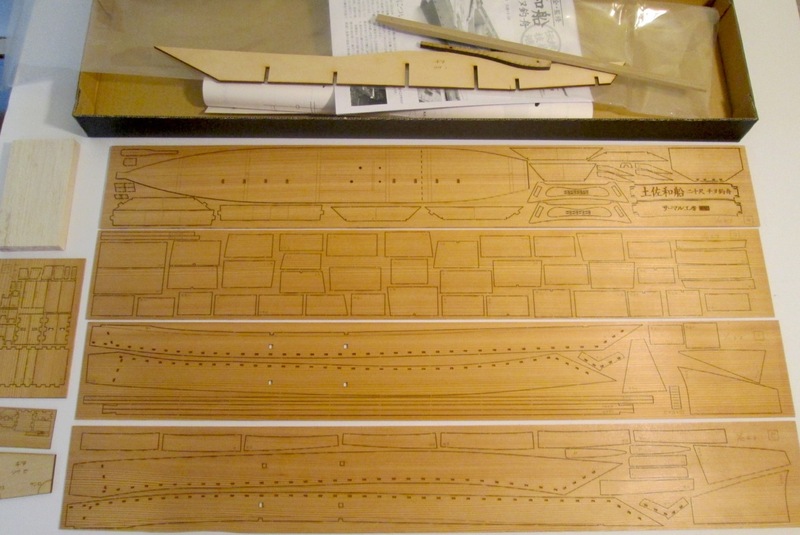 The stern deck is made up of 5 pre-cut boards, but the pieces are of different widths. The instructions don’t show you, but the plans provide the labels, so you can locate the needed pieces. You don’t have to read Japanese, but you do have to match the characters on the plans with those on the parts. These characters don’t actually mean anything here – They’re basically no different than labeling parts as A1, C2, etc. Most of the parts in the kit are identified this way. Something else to note is that the pieces aren’t necessarily placed on the sheets in any order. Efficiency of material was very obviously given precedence here, so related parts may be separated quite a bit. 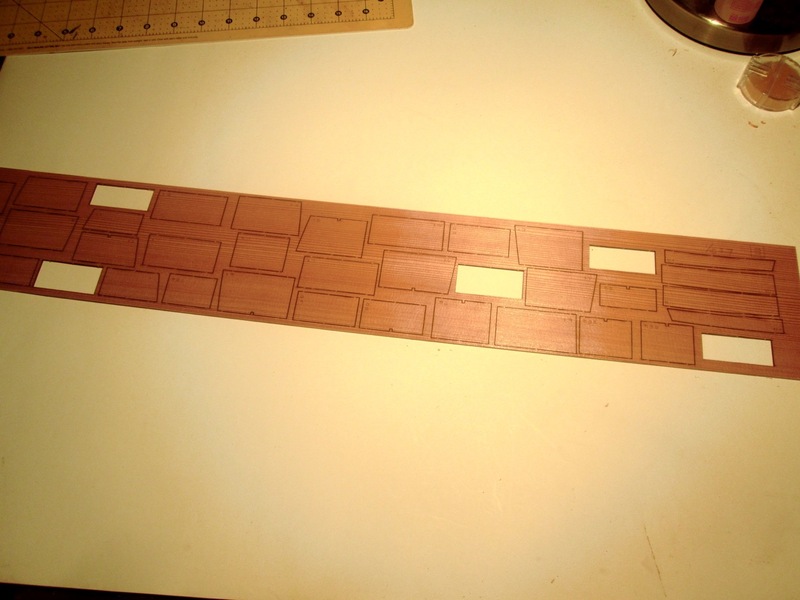 You can see this by how these deck pieces are located on the laser-cut sheet. 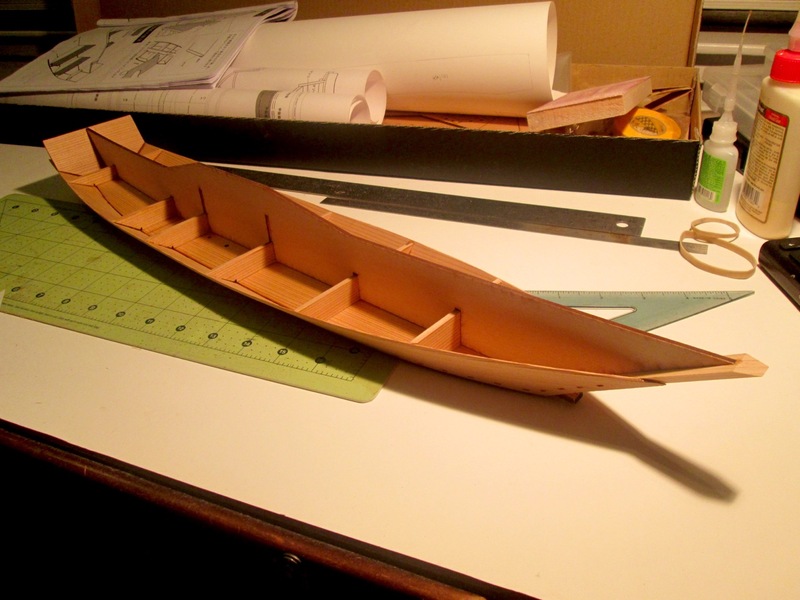 The deck parts were glued up and I then placed them on the hull and traced the edge onto them using a pencil. This was then trimmed by knife and sanded to fit the hull. As I mentioned before, trimming Japanese cedar with a knife can be quite tricky as the wood is soft and the grain is hard, so the knife catches the grain and wants to follow it, so extra care is required. One thing you’ll notice is that the part labels are etched onto each part, so you have to either hide the labels or sand them off. Or, you could always just ignore them. They’re not that easy to see unless you’re looking closely. 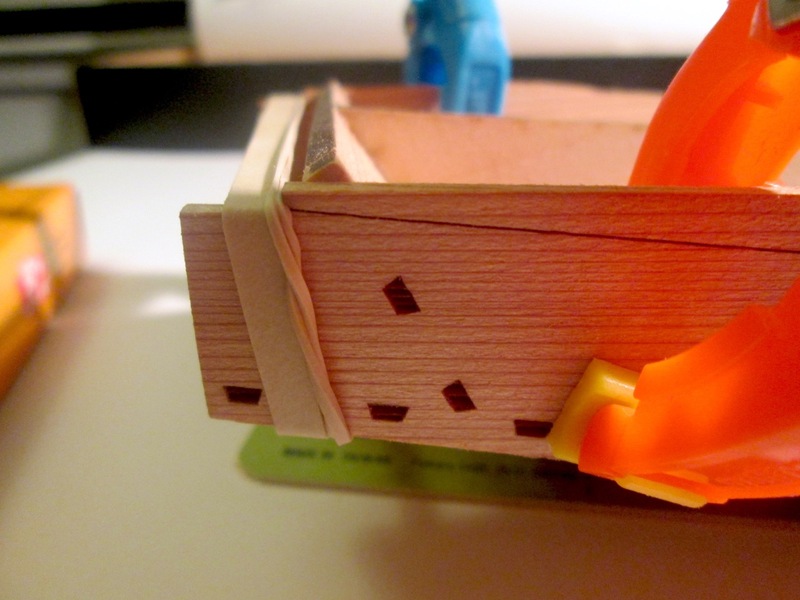 In this case, I just glued the boards so that the labels will all be on the underside of the deck. We’ve now come to the stage on the Tosa Wasen model where I became a bit confused about the next step of construction. 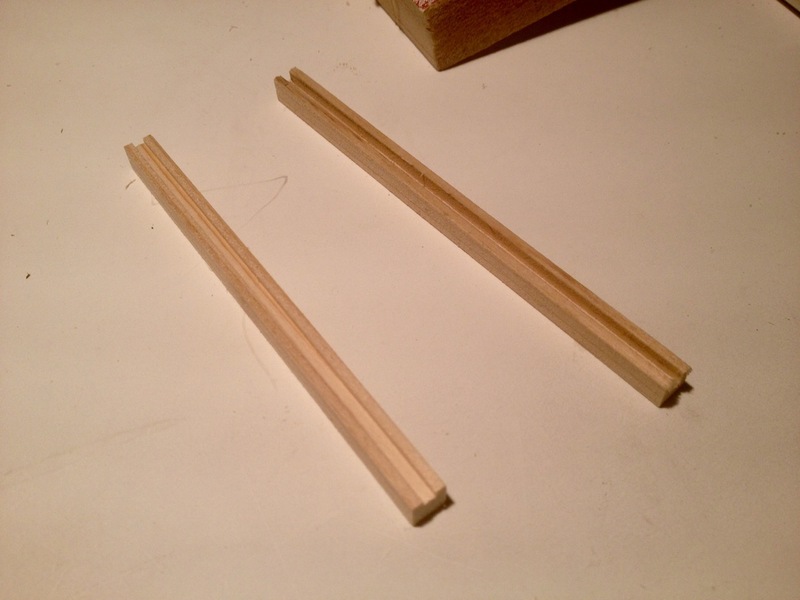 It involves installing a rail, and I suppose that it may simply be a matter of getting accustomed to traditional Japanese building methods which, as far as I can tell, this kit seems to follow quite closely. The first problem I ran into was that the ends of the long rail pieces that have to be added first. These are notched to fit to the beams at the bow and stern, but the pieces are too long to fit. 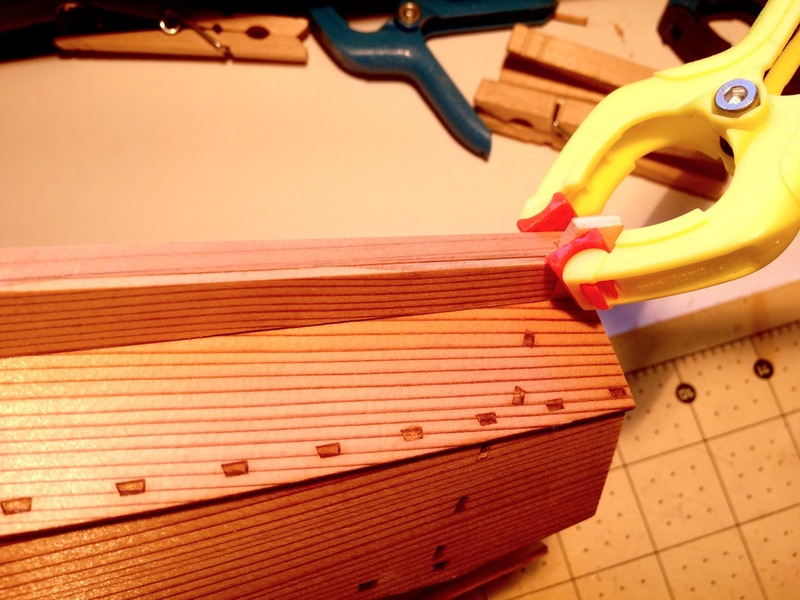 So, the notch at one end can be used, but the other end has to be cut to deepen the notch. More than this, where on a western style ship, we’re accustomed to installing framing and then attaching the rail onto that, with Japanese boats, the process is reversed. The rail is installed to only a few attachment points first, then the supports are added afterwards. This is something that I’ve seen in hull construction of Japanese boats too. 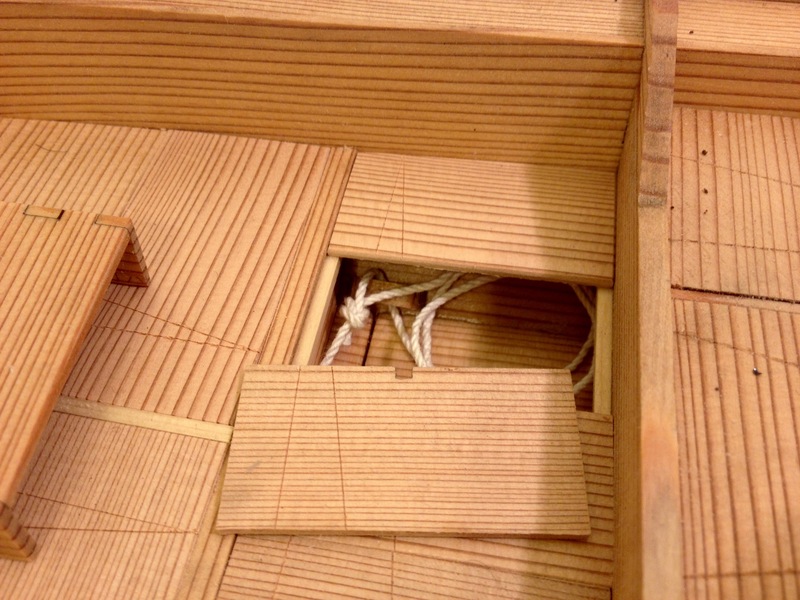 The hull planks are edge fastened and bent/clamped into place in the process, and the framing is installed afterwards – Lessons in traditional Japanese boatbuilding! Of course, this isn’t limited to the Japanese or Asian ship/boat building. 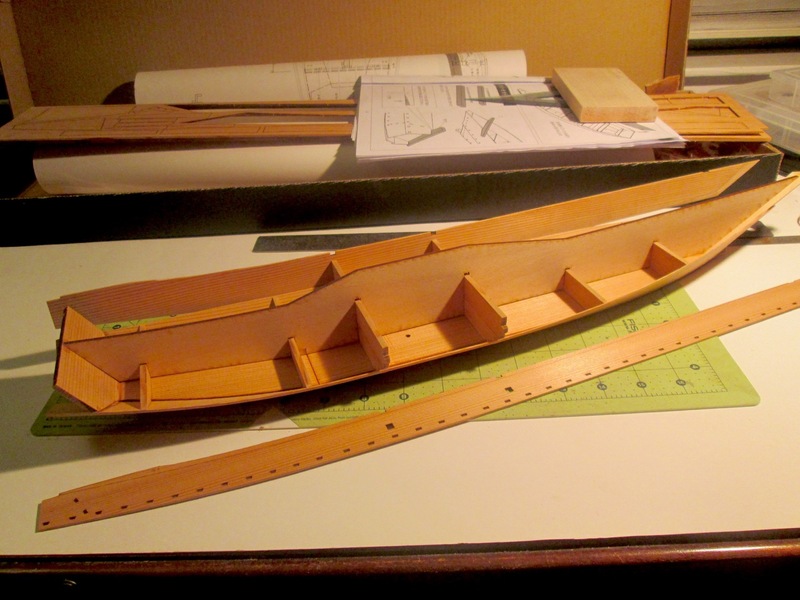 Thinking back, I recall local ship modeler and marine archaeologist Ed Von der Porten (he’s written a number of articles that have appeared in Ships in Scale) talk about modeling a Basque whaler and about how frames were added after the planking process had begun. Anyway, I finally worked it out in my head, and the rail construction progressed. 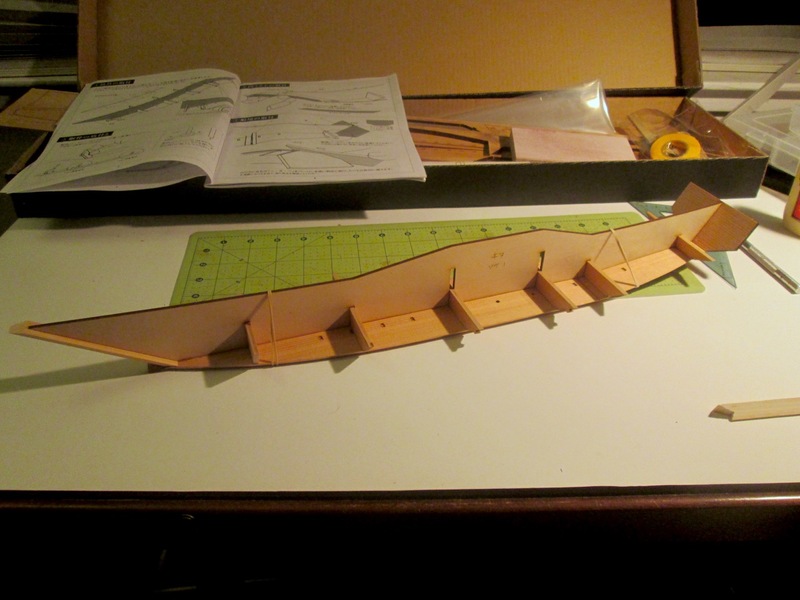 I completed construction of the rail, adding the pieces that make up the underside. With these in place, it’s a much stronger structure. To fit the pieces into place, I had to soak the cedar pieces a little bit to impart a slight bend or twist here and there. I took the shortcut of wrapping the pieces with a wet paper towel and putting them in the microwave for about 30 seconds. This was just enough to do the trick. Along the underside of the rail on the upper hull planks there is a laser-scribed line to help position the underside pieces of the rail. After the rail was completed, I went ahead and added the stem and other hull details, including a thick strake located on the upper hull planking, just underneath the recently completed rail. You may notice that the stem is lighter than the rest of the hull. 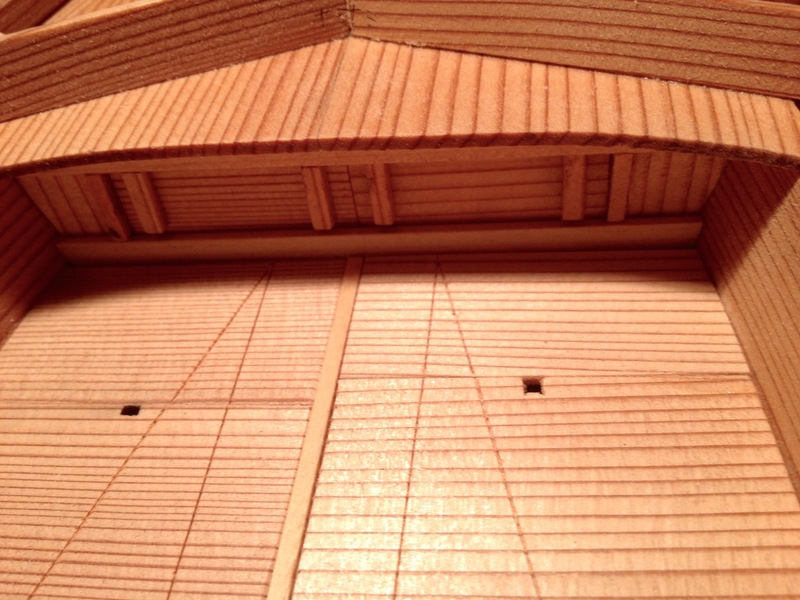 Like the stern beam, the stem is make of Hinoki or Japanese Cypress instead of Sugi, Japanese Cedar. Next, it was time to paint the bottom of the hull. The finish of the hull bottoms changed a bit over time. But, what we see as common for the Edo period would be black paint. The kit actually included a roll of narrow yellow masking tape from 3M which worked very well. For paint, I used a model paint sold by Caldercraft as part of their Admiraly Colors line. There was no particular reason I used this other than to test the paint out. For all other wasen models I’ve built, I used artist’s acrylics Mars Black from Liquitex. In fact, the result using the Caldercraft paint was just a bit shinier than I would have preferred, but it came out fine. I keep trying other hobby paint brands and often end up just coming back to the artist’s acrylics. While I was at it, I went ahead and added the splash rail, which sits on the bow deck. The joint where the two piece meet and also the bottoms of the pieces had to be beveled to fit properly. Finally, I built the well area. This was pretty straightforward, though I did start to run into little discrepancies in parts alignment, which is going to happen on kits with pre-cut parts. Also, a reminder that it’s REALLY easy to over sand the kit’s Japanese cedar. 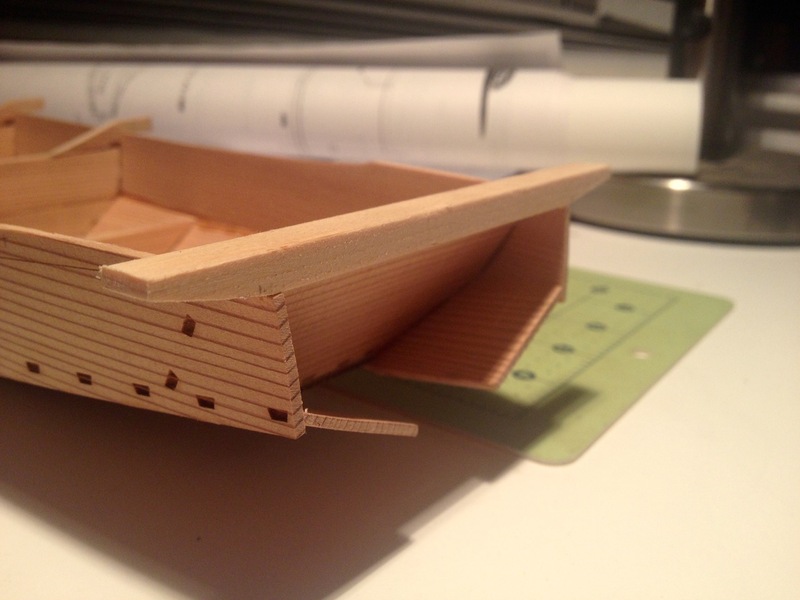 The bottom of the boat will be comprised of covered compartments. So, beams and ledges will be added to seat the deck boards / compartment covers. The well section is the tallest compartment. Here, I’m adjusting the position of the ledge that I’m gluing into place on one of the well partitions. I used wood from the sheet of deck covers as a guide for exact positioning of the ledge. This assures that the deck covers will be flush with the tops of the partitions. Here’s the completed well area. Note the ledges glued to the hull. Before the deck covers can be added, beams and more ledges have to be added. I’ll cover this next time, along with the covers for the bow and stern holds, making the “Ro”, which is the Japanese name for the long sculling oar, and the final accessories such as the anchor and the bailer, etc. The next installment should see the completion of our Tosa Wasen. 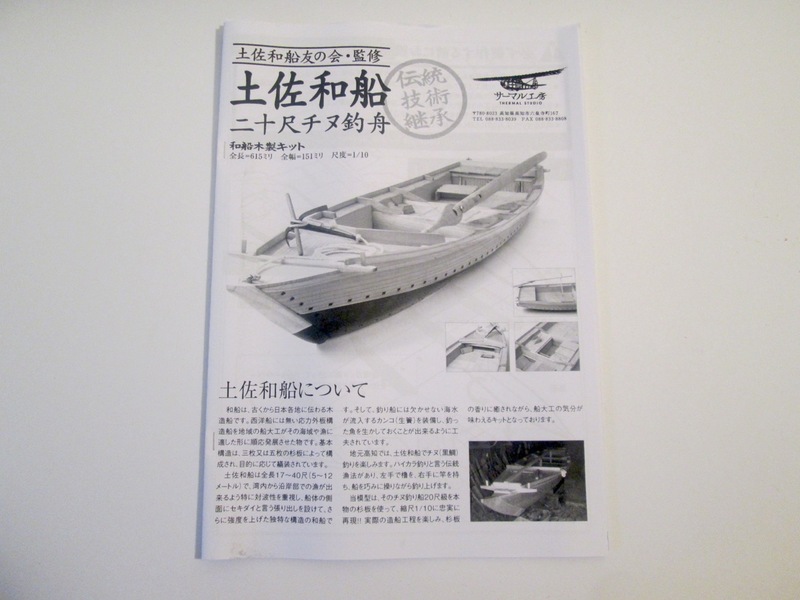 This entry was posted in Ship Model Build Logs, Ship Modeling News, Tosa Traditional Japanese Boat and tagged Japanese Boat Models, Japanese fishing boat, Thermal Studios, Tosa, Traditional Japanese Boat Building, Wasen on December 28, 2015 by catopower. Last time, I left off with the basic hull completed. Now comes the detailing. A pair of beams are provide which are attached directly on top of the upper hull planks. These are first tapered from underneath so that at the ends they are reduced to half thickness. The fore beam referred to here as the ツノ or Tsuno (tsue-no), and the stern beam is the オオトコ or Otoko (oh-toe-koh). 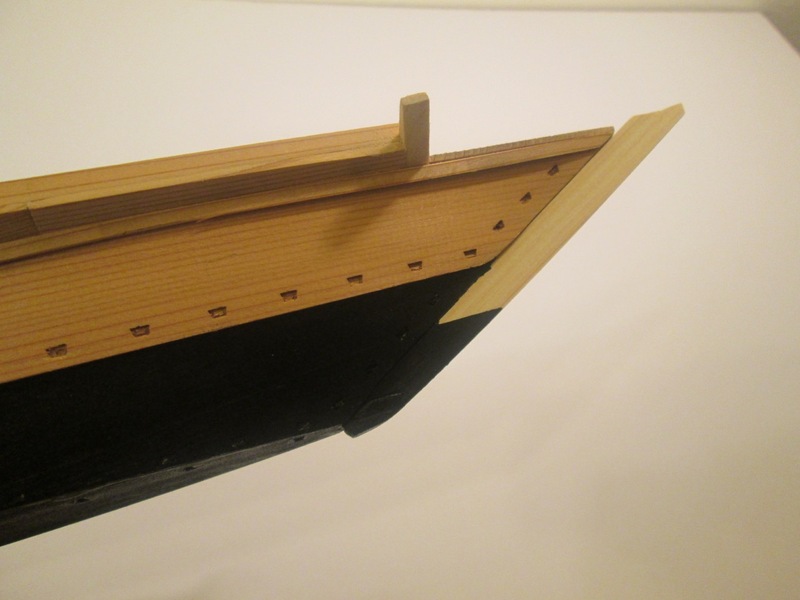 The heavy stern beam in particular is a common feature of traditional Japanese boats as it is used to mount the rudder on some boats, and usually bears the seat for the sculling oar. One thing you might note about these beams is that the parts are made from a lighter colored wood. 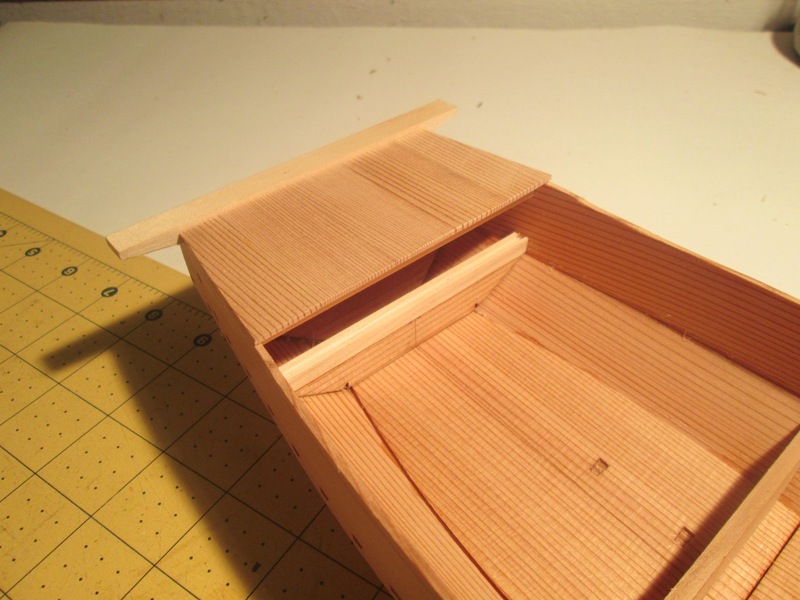 True to the original boat, instead of the Japanese Cedar used for the hull planks, these parts were usually made out of Hinoki (Japanese Cypress) because its greater density and strength. At this time, there are some extension pieces located at the midships frames (I was calling them beam initially, but now they’re built-up high enough to call them frames or bulkheads). I don’t know what it’s called yet, but this boat has an extended rail outside of the hull and these pieces are the central supports for it. These small pieces initially had a lot of char from the laser cutting on top and bottom. I was as careful as I could be to not take off too much material. But, the cedar is relatively soft and it sands a little too easily here. But, I seemed to manage okay and essentially got the char off. By the way, something interesting about that space between the frames that you see in the photo. In the center portion of the hull bottom, there are a few holes. I believe that this might have served as some kind of “live well” that must fill with water through those holes. There are in fact, two sets of holes. Near the forward bulkhead, there are two smaller holes in the bottom, and I believe these open into a smaller, separate section that might have been for storing bait. I’ll report on this at another time after i’ve collected some facts. 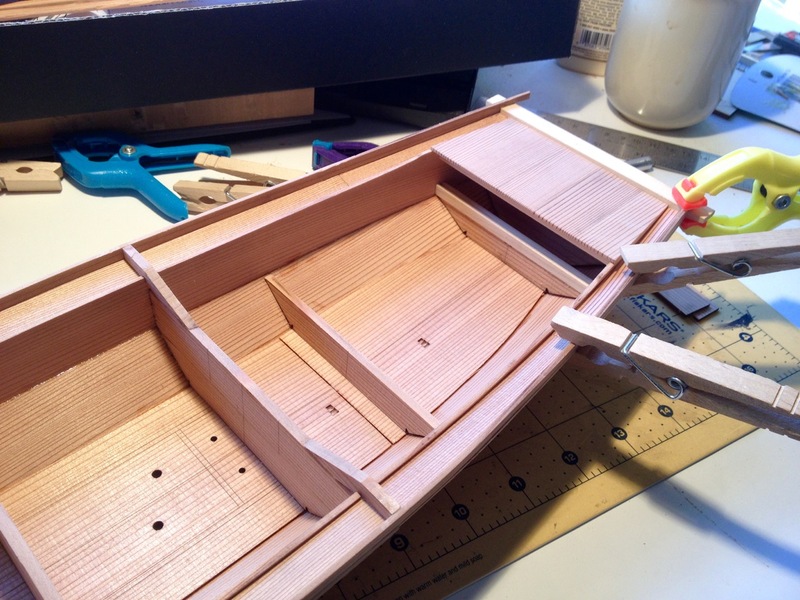 So, next step was to add the upper and lower slotted beams, which will hold removable doors to allow access into the bow and stern storage compartments. The ends of the beams had to be sanded down to fit nicely in place. A special template is provided to make sure that the beams are properly aligned. 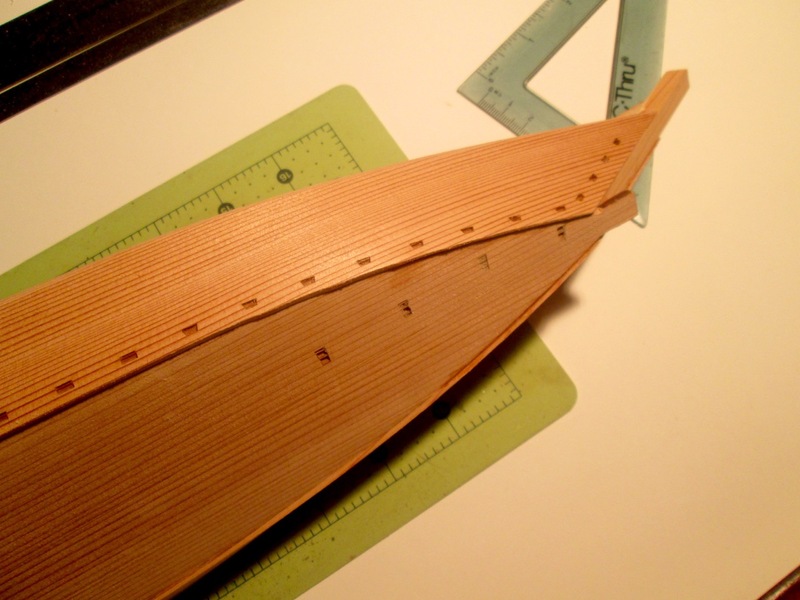 One side of the template is used for the bow and the other side is used for the stern. The angles are different enough so that it’s pretty obvious which side is used for which end of the boat. You don’t need to read Japanese to figure that much out. One of the issues I ran into was that the tops of the upper hull planks weren’t perfectly aligned. So, I made an extra effort to make sure the gap between the upper and lower beams was consistent. 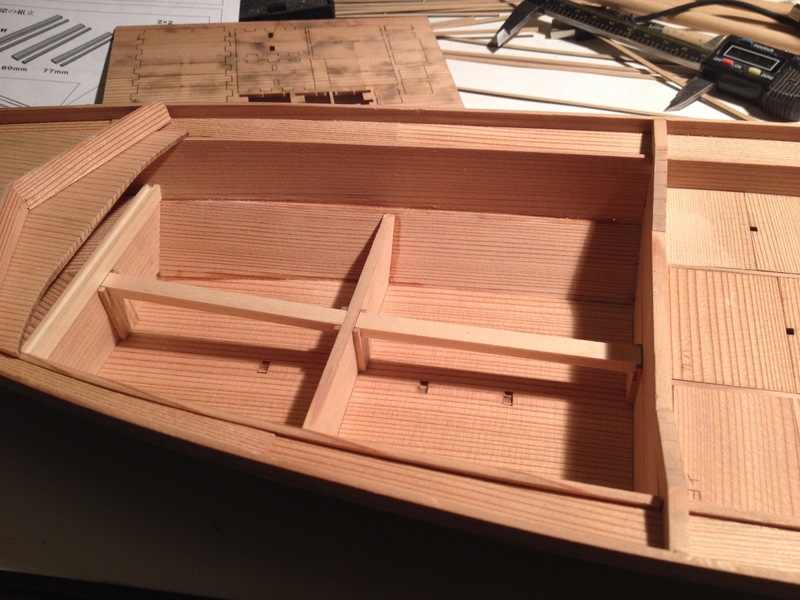 After the stern pieces were done, I assembled the floor of the bow storage compartment. Interestingly enough, the two pieces that make up the floor aren’t two symmetrical halves. In fact the joint between the two doesn’t even run parallel to the centerline of the ship. You can see what I mean when you look at the photo. I’ll cover the completion of the holds next time. 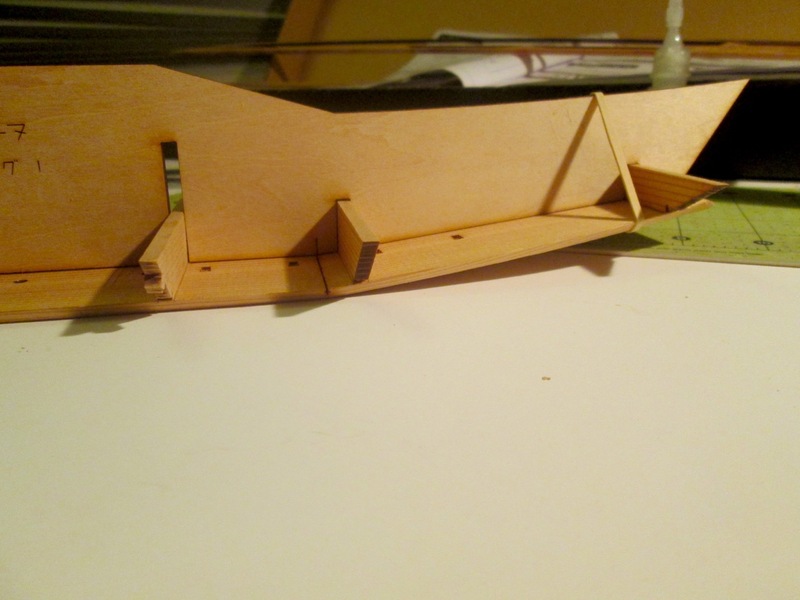 The next step is to add the deck beams to the bow compartment and then the add the bow and stern decks. 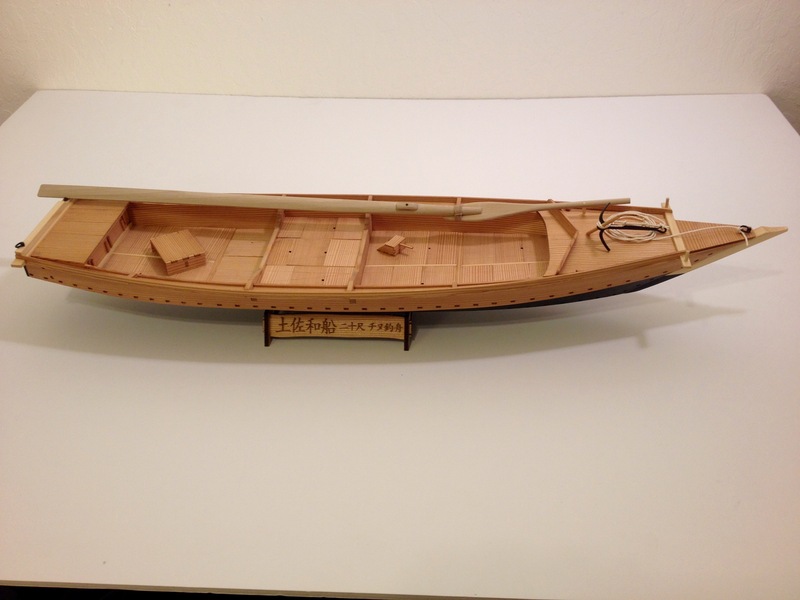 This entry was posted in Ship Model Build Logs, Ship Modeling News, Tosa Traditional Japanese Boat and tagged Japanese fishing boat, Thermal Studios, Tosa, Traditional Japanese Boat Building, Wasen on December 7, 2015 by catopower. With the lower planks in place, there are next two support beams that were glued in place. 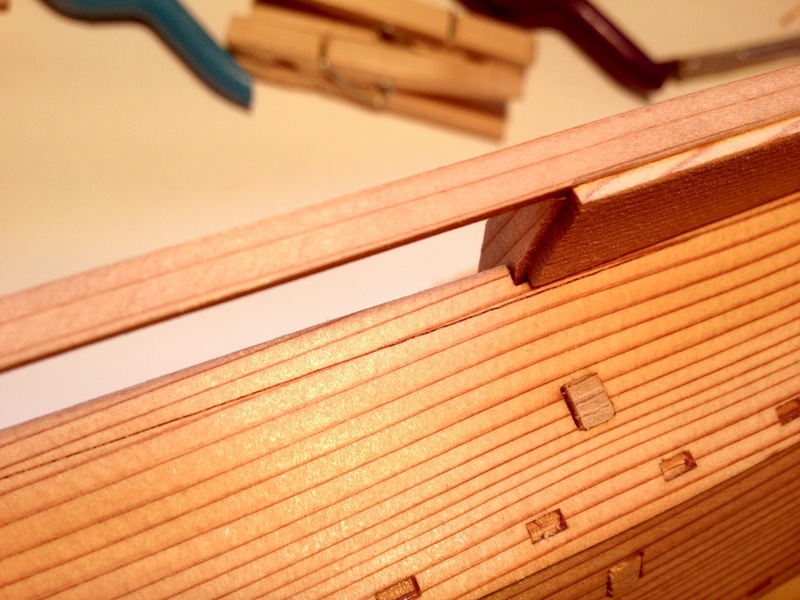 Like the pair of lower support beams that the lower planks lock into, these upper support beams are notched so that they fit into holes in the upper planks. When the glue on those beams was drying, the upper planks were cleaned up the leading edges were tapered the same way as the lower planks. The lower planks were then glued to the support beams described above. As with the lower planks, the upper planks were then initially glued only at the transom and at the stem. Fitting the planks was fairly easy at the stern, but was a bit harder at the bow. There, the planks are hard to seat tightly against the stem since there is some overlap between the upper and lower planks. This definitely took a lot of hand pressure and the use of medium CA glue since I couldn’t get a clamp onto the bow. I just had to hold the planks tight as long as possible until the glue set. At the stern, the planks were much easier to glue. But, I did run into one self-created problem that was actually less of a problem than I’d realized. 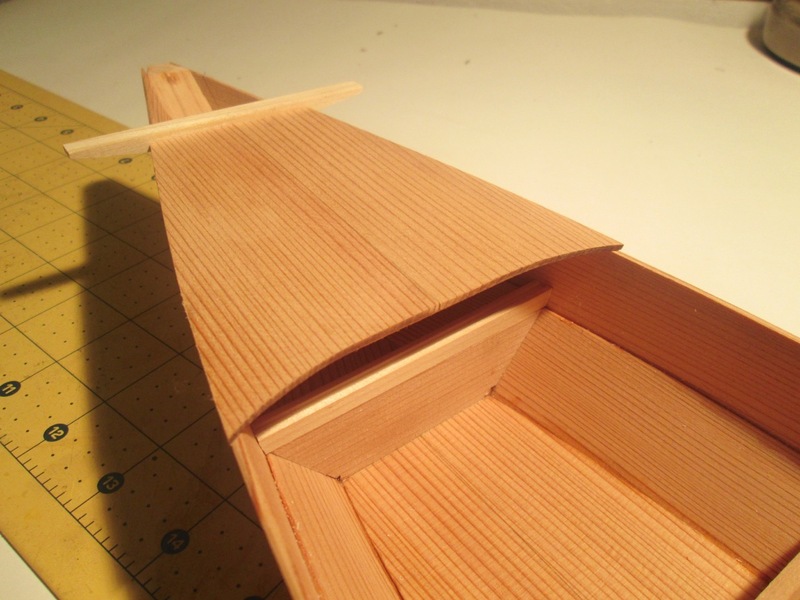 The stern edge of the transom should have been lined up with the edge of the notch where you see the rubber bands in the above photo. I cheated a little in order to fix the problem by trimming the leading edge of the notch, effectively moving the notch forward. A beam is supposed to fit precisely into this notch, so I had to sand the stern edge of the planks just enough so the size of that notch was retained. But, as it turns out, the top of the transom gets sanded flush with the top of the planks and later the whole section gets covered with planks right up agains that beam anyway, so you wouldn’t have been able to tell that the transom didn’t touch the edge of the beam, unless you looked up at it from underneath the boat. With the planks secured in place, I then ran a thin bead of CA glue all along the inside of the joint between the upper and lower planks. Lots of clamps made sure that the planks were held properly together until the glue set. After a while, it was safe to then remove the temporary strong-back, which was a nice and satisfying milestone in the build. With that, the basic hull is complete and we have something that now looks like a boat. 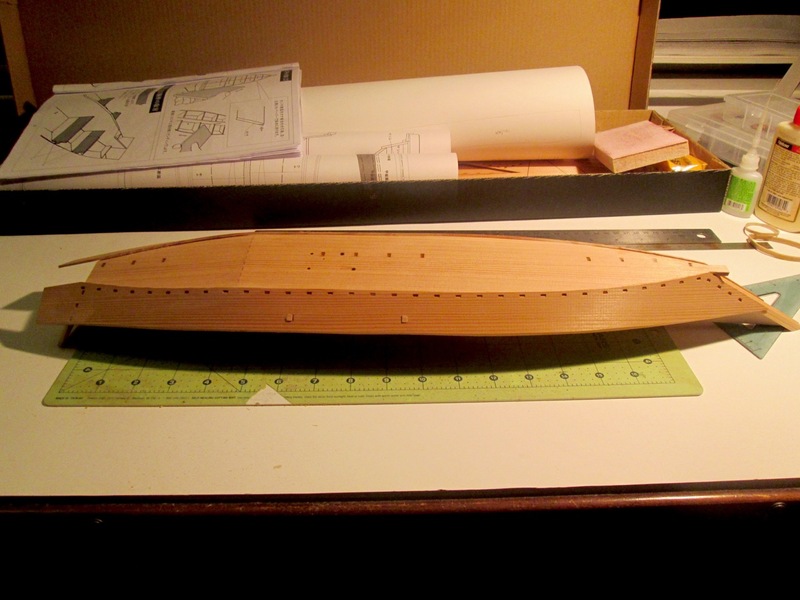 There is still the outer stem to add as well as some stern trim that protects the ends of the planks, but aside from that, it’s pretty much time to start detailing. 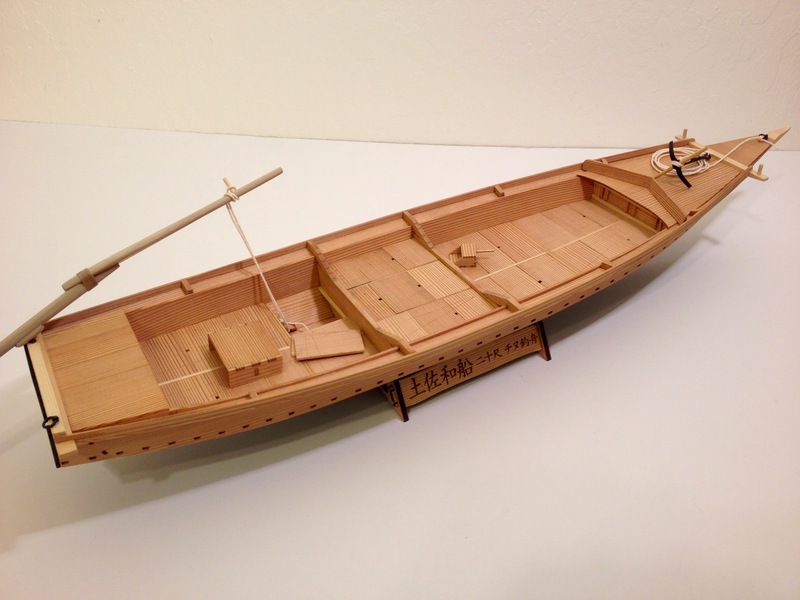 This entry was posted in Ship Model Build Logs, Ship Modeling News, Tosa Traditional Japanese Boat and tagged Japanese Boat Models, Japanese fishing boat, Thermal Studios, Tosa, Traditional Japanese Boat Building, Wasen on December 5, 2015 by catopower. The next stage of the build is the hull planking. On a traditional Japanese boat, there are basically only 4 planks, 2 on each side, with the upper planks making a nearly vertical surface. 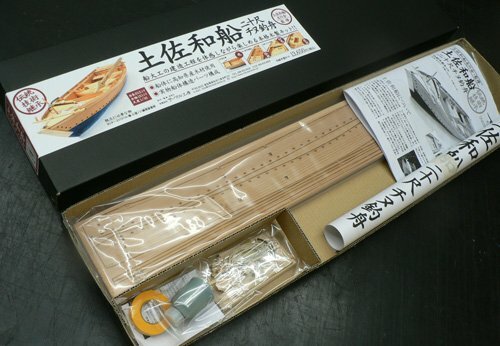 The kit refers to the lower planks as カジキ or Kajiki and the upper planks as タナ or Tana. 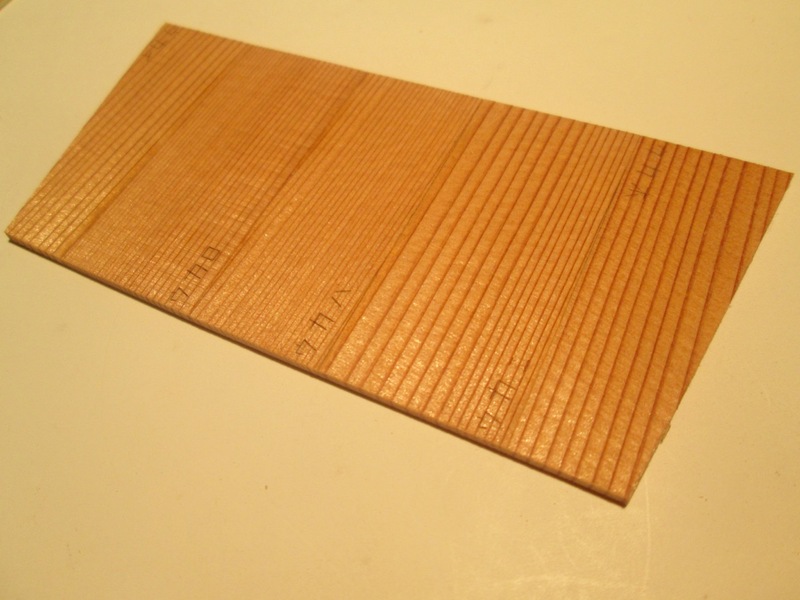 The term Kajiki is the same term used for the lower planking on the Bekabune as described in Brooks’ book and blog. And in fact, the Tosa term for the upper plank, Tana, is related to that of the Bekabune, which is the compound word Uwa-Tana, but run together the “T” becomes a “D” sound and becomes Uwadana. 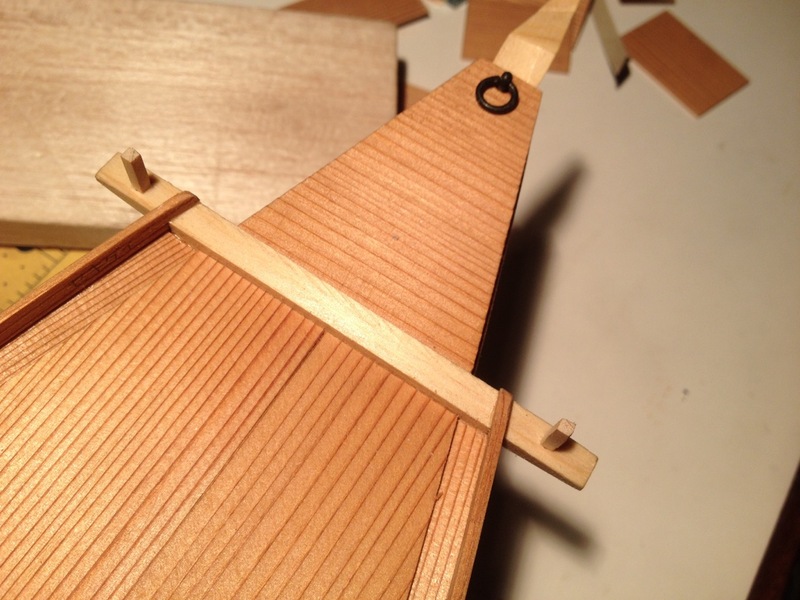 Diagrams in the kit show that the leading edge of the lower planks need to be tapered. There are measurements shown in the instructions, but the exactly shape of the tapered area is not precisely defined. It ended up being a matter of getting something to look like the shape shown in the diagram – a shape that reminds me of the tip of a samurai sword. After tapering the leading edge of the planks, it’s then a matter of fitting the planks on. The laser-cut planks have square openings that line up with square tabs that protrude from the central beams on the model. These are actually located slightly aft of center, but they are at the widest point of the boat. I found that mating the planks to those notches was a pretty tight fit, but it was good that the fit was snug, as this helps hold things together while gluing. I glued the planks to these notched frames first and let that dry, which seems to be how the instructions want you to do it. Next, the planks were fit to the transom and glued only at the transom. From what I could tell, it seemed that the top of the planks should be kept low against the frames, so that the planks ended up sticking up above the frames by only a small amount at the stern. 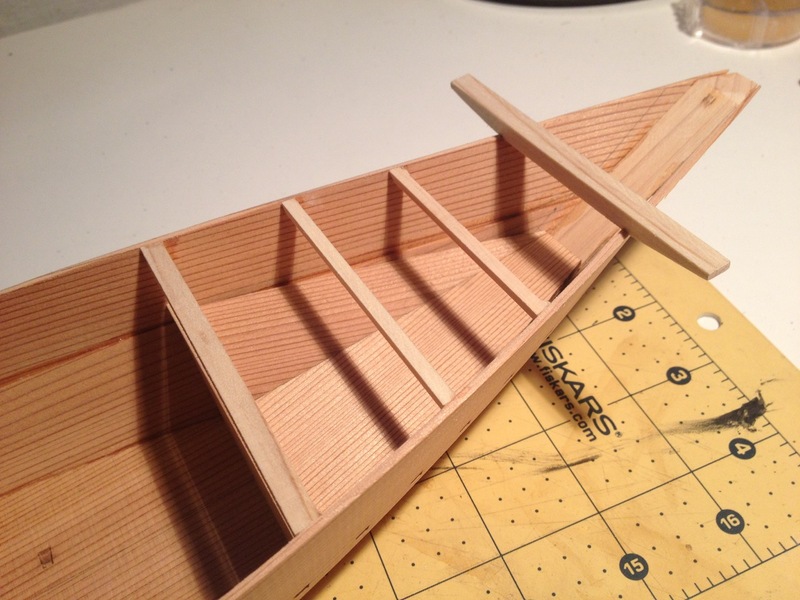 On the forward half of the boat, the planks seemed to mostly line up with the top of the frames. 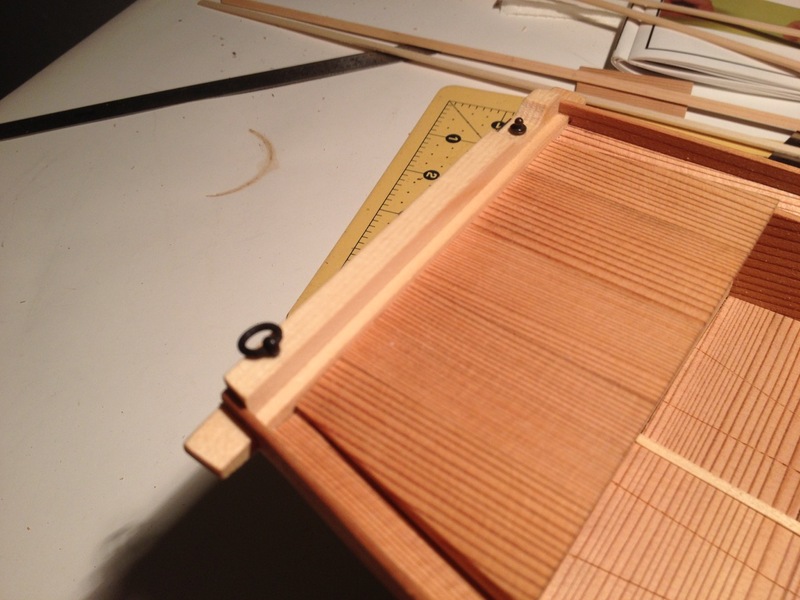 The planks were then glued to the stem, which is called the Miyoshi (mee-yoh-shee). The planks had to be positioned so that the very forward edges were flush with or just barely past the stem. After the glue dried, the rest of the planking was glued to the bottom and the frames using medium CA and the applicator tips supplied in the kit. Those, by the way, were a perfect fit for ZAP brand glue bottles. I found it a bit of a struggle to hold the boat while trying to glue the lower planks into place. 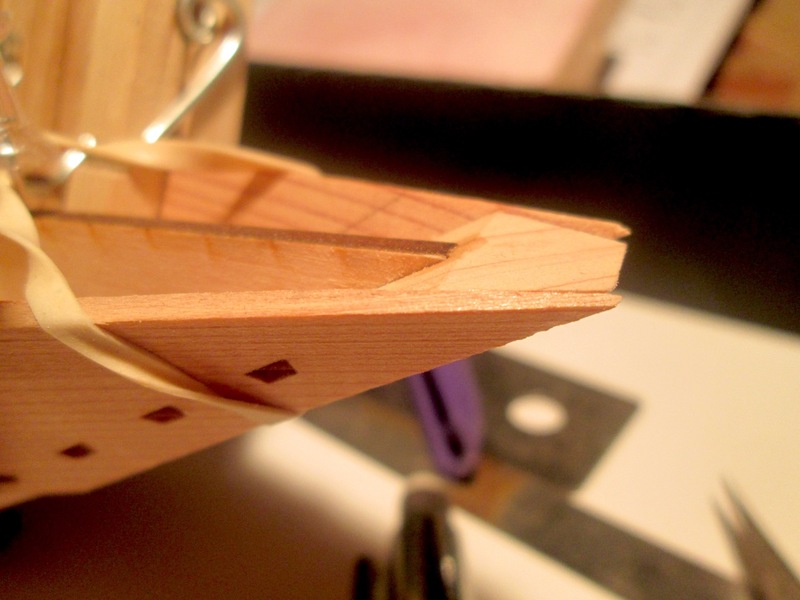 The strong-back in the center is only glued in at the top and bottom of the transom and the stem, so it’s very flexy. It took a while to learn to hold the whole thing while bending the planks and gluing them into place. I should also mention that the kit never has you soak any of the planking. It’s long and thin enough that it flexes pretty easily. 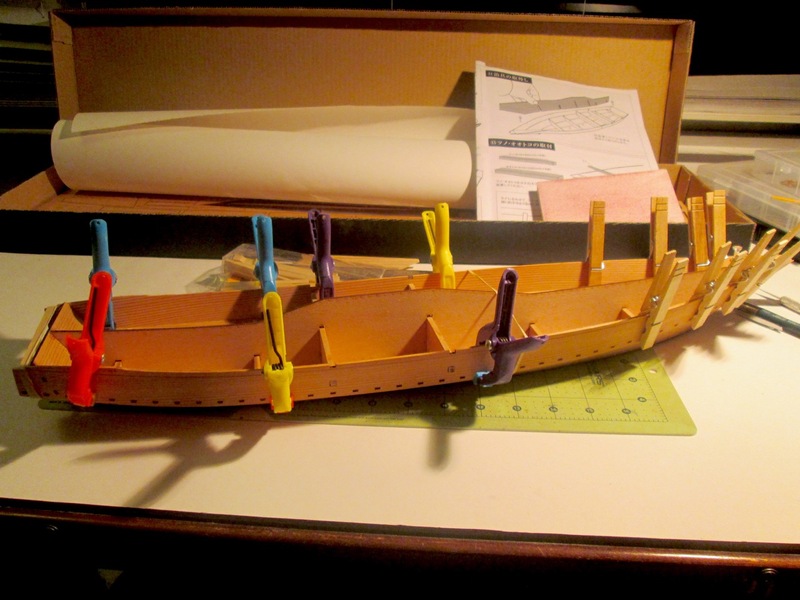 I suppose it might have made sense, as a ship modeler, to try to pre-bend the planks. But, it certainly wasn’t necessary and I managed without soaking or pre-bending the planks. I left the whole thing to dry and then came back and sanded the upper edges of the lower planks. When dealing with the upper planks, the will overlap the edges of the lower planks, and to make a good bonding surface, or watertight surface in the case of the real boat, the outer edge at the top of the lower plank has to be sanded roughly vertical. On the real boat, iron nails would be drive into the bottom edge of the upper plank and into this flat edge of the lower plank. Of course, there’s more to it than that, but that’s the basic idea. 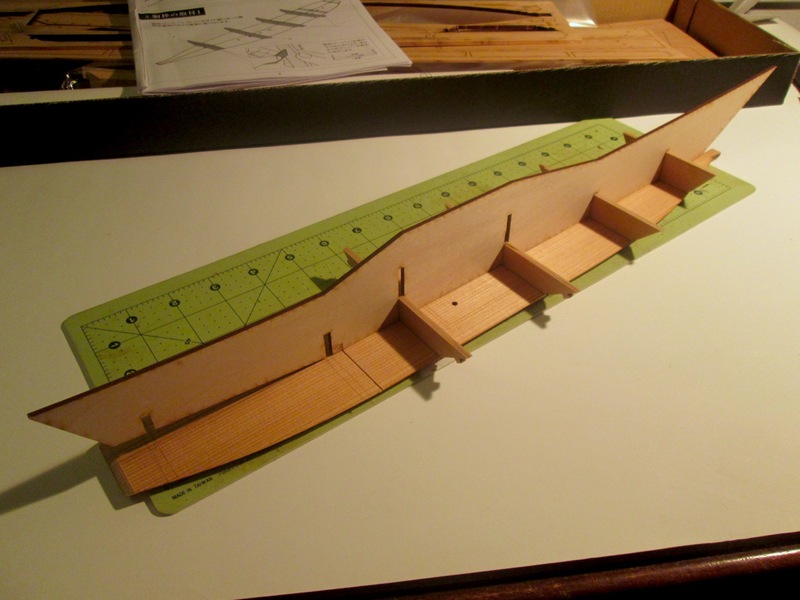 The model is just about ready to receive the upper planks or the Uwadana. 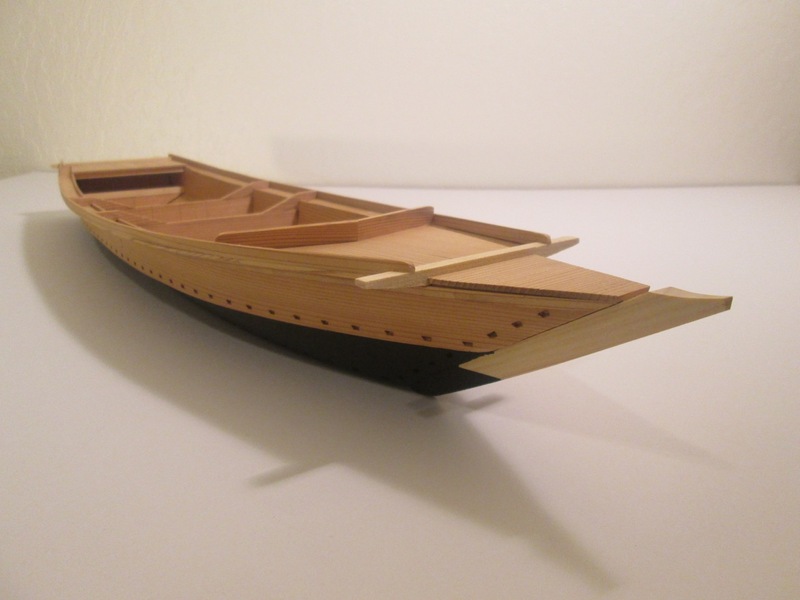 This entry was posted in Ship Model Build Logs, Ship Modeling News, Tosa Traditional Japanese Boat and tagged Japanese Boat Models, Japanese fishing boat, Thermal Studios, Tosa, Traditional Japanese Boat Building, Wasen on December 3, 2015 by catopower. The build begins with the floor piece. There are apparently different regional names for this and I don’t know what the name is in the Tosa region. The term カワラ, or Kawara, is shown a lot for it in the instructions, so I assume that’s the regional term in Tosa. I’ll have to send an inquiry about these things at some point. 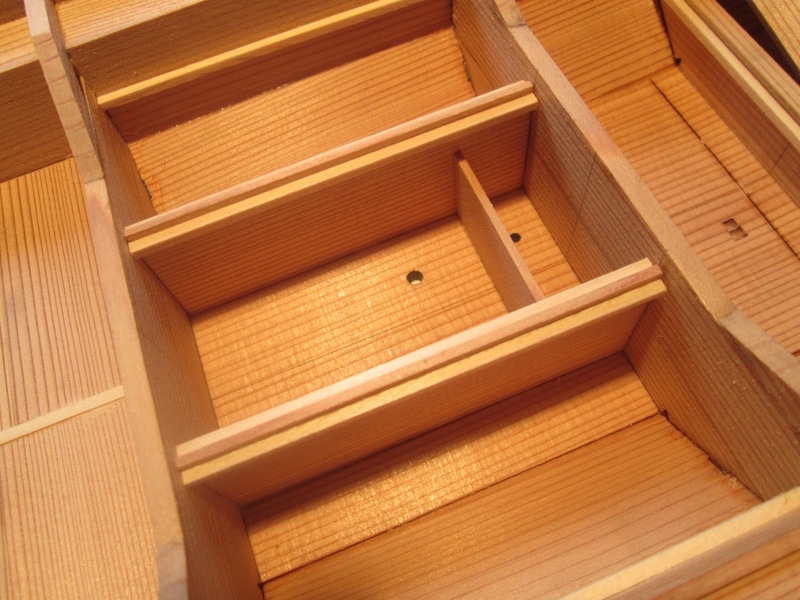 The first step in the kit is to bevel the bottom edge of the kawara. To aid in this, there are laser scribed lines. Interestingly enough, the sheet with this part is actually scribed on both sides. I’ve never seen that in a model kit. This means that the manufacturer had to register the wood and the laser in some way so that the cuts on one side line up with those on the other side. Something interesting about working with the Japanese cedar. Where those dark lines in the grain show, that’s where the wood is more dense. When carving, you have to be aware of that because those lines are harder to cut through than the lighter colored wood in between. These dark lines are also harder for the laser to cut through. So, if you look in those etched trapezoidal holes, you can see lines of wood that line up perfectly with the grain. I started to trim out those ridges in the cut-outs. There aren’t that many really, so I’ll probably continue with that as I go. The other issue with those lines is that they can make the laser scribed lines very hard to follow. Woody Joe uses laser scribing to mark the beveling lines on their kits too, but they use light color Hinoki, so I ‘ve never had to deal with hard to see scribed lines before. The next thing is to partially cut through the Kawara at the dashed line. This is where the bottom of the boat angles upwards. 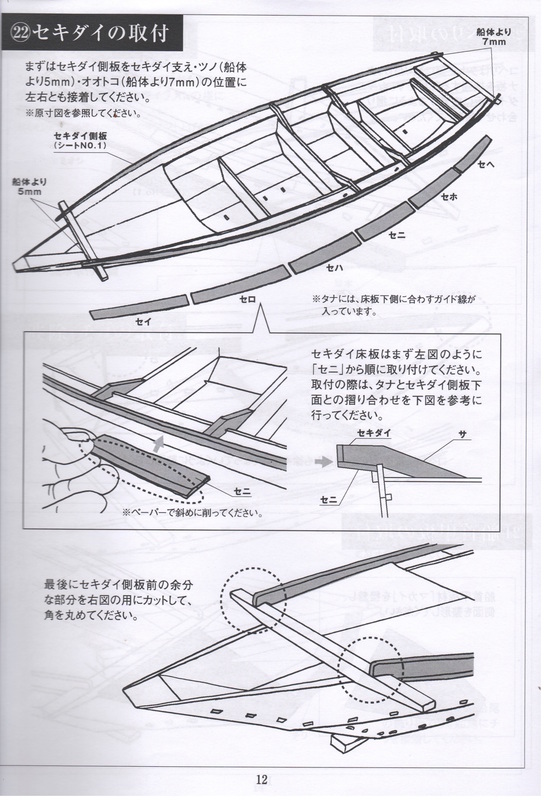 In his book Japanese Wooden Boatbuilding, Douglas Brooks describes this as Kirimage (kee-ree-mah-gay), or “cut bending”. I don’t know about the Tosa boats, but the Aomori boat he worked on used a technique like this, though there’s more to it. In my case, I thought this was a good opportunity to bring out my Japanese hobby saw, which is a very thin pull-type saw. The problem was that it was too thin. It cut nicely, but didn’t leave room for the piece to bend upward. So, I pulled out my old razor saw and I cut the line several times, holding the blade at different angles, so that it would cut more of a V-groove. With that done, I could add the floor frames. These are permanent frames, thought a long strong-back piece serves as a temporary alignment guide. This was interesting because so many Japanese boats are frameless, or close to it. At some point I’ll look into this further. On the real boat, these may have been added after the planks were in place. There was a fair amount of char on the edges of these and all the other wood pieces. The kit includes a large flat sanding block that made clean-up of these parts pretty easy. I did notice that there was a fair amount of smudging on the wood faces though. I cleaned these up as best I could. I used the sanding block, but tried to keep working very lightly. I test fit the stem to how it was all going to work. The stem is made up of an inner piece and an outer one. The outer stem gets added later, but the inner one goes on next. I wanted to make sure I understood the design before continuing. First, I had to made sure the strong-back was properly aligned. The main issue was to keep it centered and perpendicular to the Kawara. 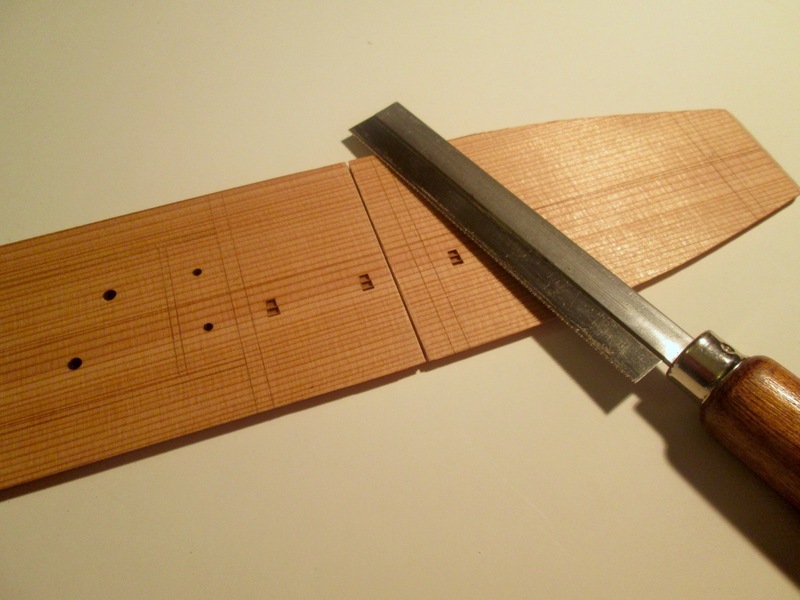 The piece is also to be spot glued at the very ends to keep it in place until it is removed in a later step. Here’s where I’m at now. Steps 1 through 6 have been completed. 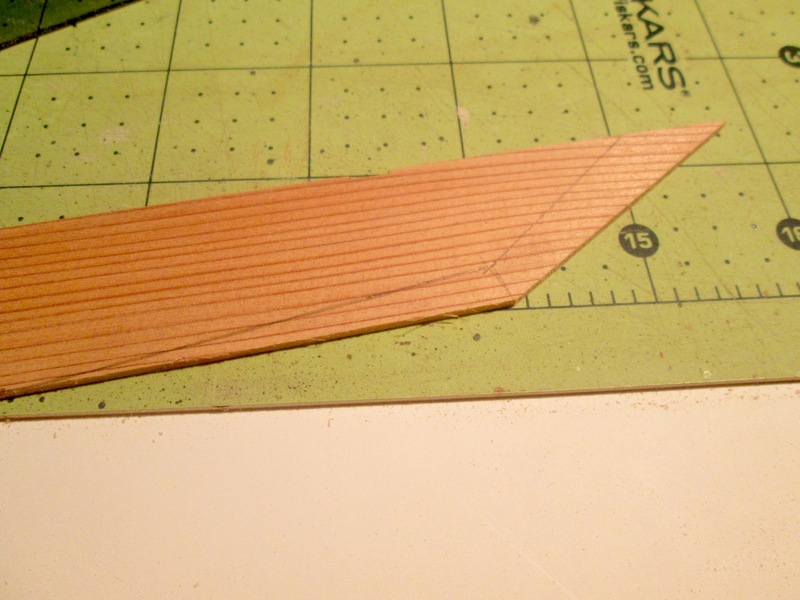 I have only to bevel the stern most frame and the transom to complete step 7, then comes the lower planking. Japanese boats use very wide planks that are often very thick. On the Tosa wasen, the planks appear to be as much at 18″ wide. I went ahead and started prepping the lower planks. Where I am cutting in the photo, the laser does not completely cut the dark lines of the wood, so I have to go over this with the X-Acto a few times on each side to cut the pieces free. 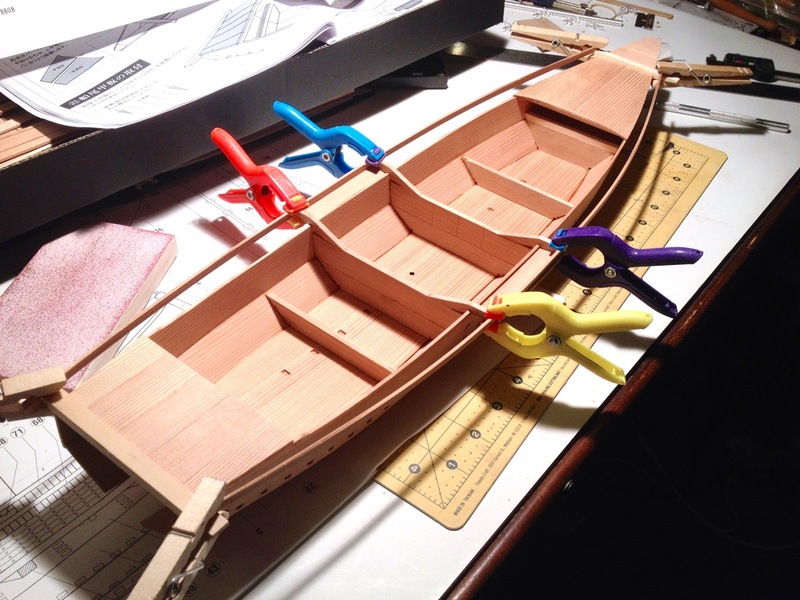 This entry was posted in Ship Model Build Logs, Ship Modeling News, Tosa Traditional Japanese Boat and tagged Japanese Boat, Japanese fishing boat, Thermal Studios, Tosa, Traditional Japanese Boat Building, Wasen on December 2, 2015 by catopower. With the Thanksgiving holiday last week, I’d been home a lot except for one day, Friday. Naturally, that’s the day the postal carrier showed up with the package from Japan. With nobody home to sign for it, I had to wait the extra day to pick up the kit. Fortunately, the Post Offices are still open on Saturdays, so in short order, I had the package. The kit is not all that heavy, about 1-1/2 pounds, but it’s in a long box. I think this kicked the shipping cost up a bit, which was just about $30. Still, a ship model kit, particularly one this rare, for around $170 total, is not bad. That’s just about what I paid for the Woody Joe Hacchoro and the Yakatabune kits I bought from Zootoyz. Having ordered through Amazon Japan, the only seller of the kit did not ship internationally, so I had it sent to someone that then re-shipped it for me from Japan and they didn’t charge me any service fees. He’s done this twice for me and I don’t want to impose on him any further. There are companies specifically set up to forward packages from Japan. I just finished setting up an account with one called Tenso.com. Next time, I’ll try them out. By the way, it looks like I may have been wrong about this kit being out of production. I thought it was no longer manufactured because the company that makes it, Thermal Studios, primarily makes large model glider kits and doesn’t list the Tosa Wasen kit at all. However, I emailed them about it and if we understood each other correctly, they produce the kit. Perhaps it’s more of a local item since they are apparently close to Tosa, Japan, and seem to have some kind of connection with the Tosa Traditional Boat Society. The kit itself is basically made up entirely of several laser cut sheets, plus a small bag with various kinds of parts, some other separate laser cut and milled wooden parts, instruction booklet, plan sheet, and even a sanding block. 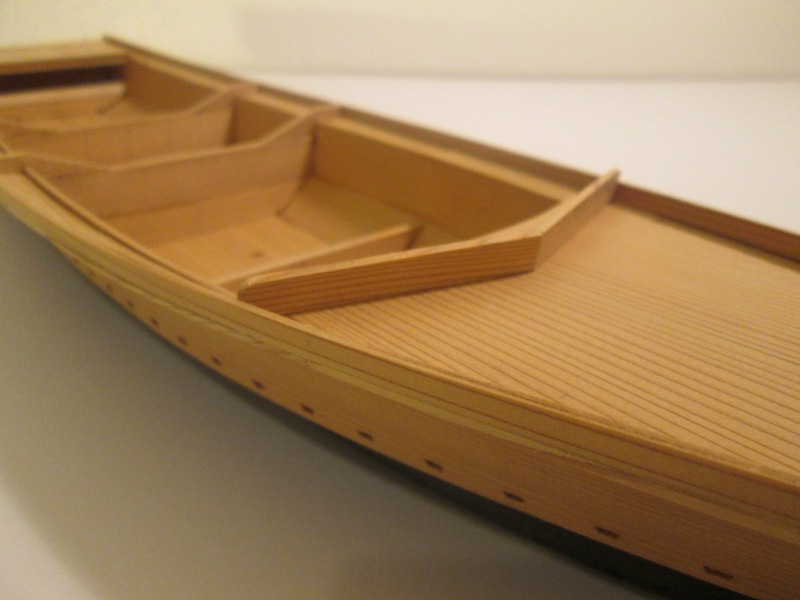 The laser cut sheets are made from Sugi (that’s “Sue” plus “Gee” with a hard “G”) or Japanese cedar, just like the real Tosa boats. Sugi is aromatic, though not as strong as the Hinoki used in so many Woody Joe kits. The parts are laser etched with Japanese characters to identify them. This probably makes locating parts a little more time consuming than if they were numbered. But, it’s just a matter of pattern matching. The bag of parts contains all the milled wood parts, all short pieces. Also in the parts bag is the metal anchor, the anchor rope, metal rings and fastener. The kit also includes a roll of yellow hobby masking tape, and for some reason, some plastic applicator tips used for applying CA glue. As expected, the instruction booklet is all in Japanese. The black and white printed book is 26 pages long and includes a parts diagram on the back cover, showing all the laser cut parts on their sheets. The diagram is pretty small and you really need a magnifying glass to read it. But, magnified, the part identifiers all appear to be readable. Instructions are divided up into 41 steps, with each step being clearly illustrated and each looking to be pretty simple steps. 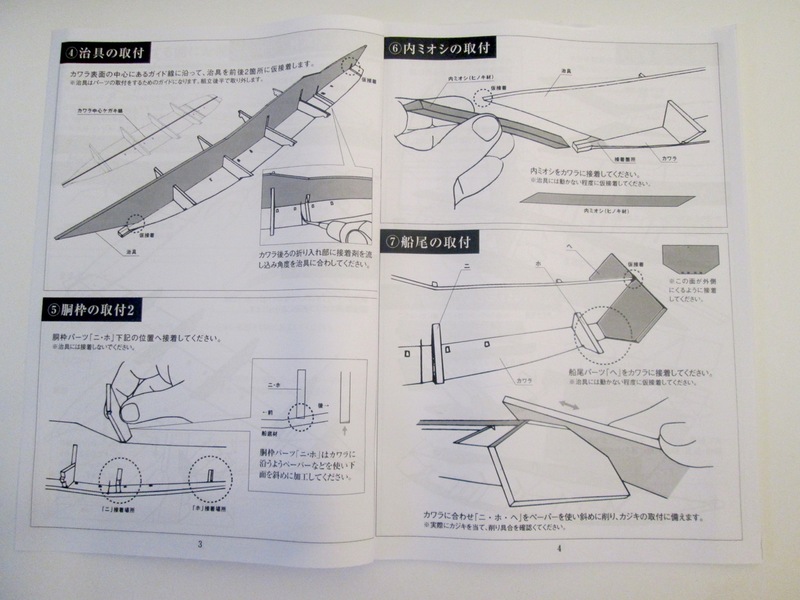 Time will tell if the Japanese text printed in the booklet is really necessary or if the model can be built solely by the drawings. 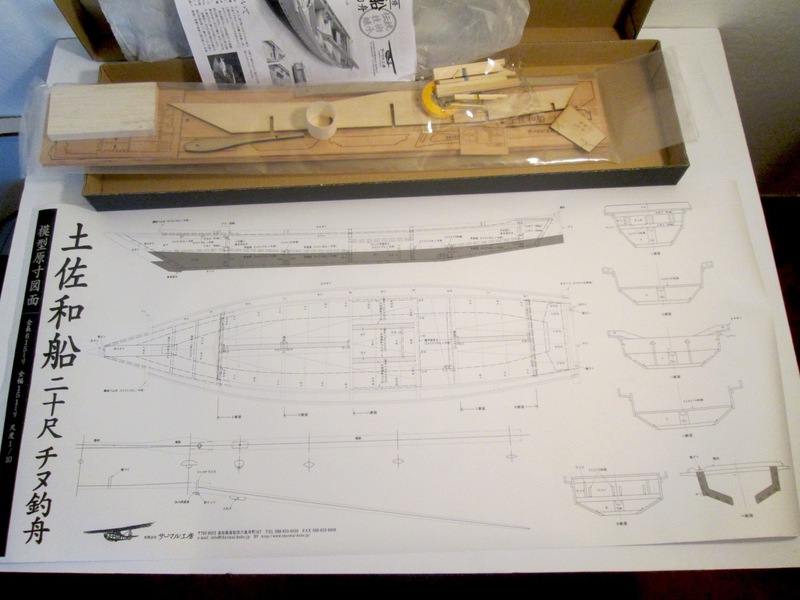 But, in addition to the booklet, there is also on large plan sheet that gives a nice overview of the boat at full scale, which, by the way, is 1/10 scale. Overall, this looks like a really nice kit and it’s not that expensive. An additional bonus is that the manufacturer, Thermal Studios, created a blog showing photos of the construction steps. This is really nice because it reinforces the written/printed instructions, giving you another view of the steps. Also, using Bing or Google translators, you can view the blog pages in English (or whatever your native language). This isn’t great as the translation can be pretty questionable, but it often helps. 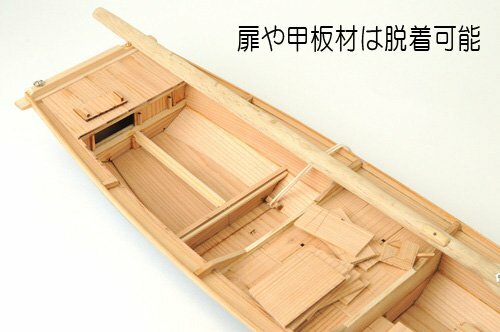 Having attended Douglas Brooks‘ talk at the NRG conference this past October, and having been reading through his book on Japanese Wooden Boatbuilding, I can say that this kit looks very authentic and true to the way that the traditional Japanese shipwrights would have actually constructed their boats. This kit would make an ideal study project for someone who is interested in following the work described in Mr. Brooks’ book. Personally, I’ve been planning on scratch building the Urayasu Bekabune that he discusses in his book. 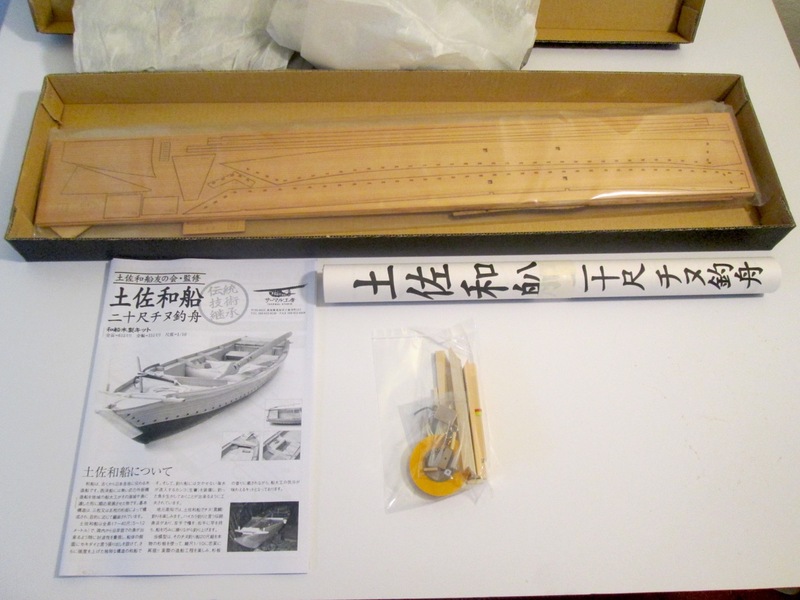 I think that building this kit first will help me a long ways towards understanding Japanese boatbuilding so that I can next attempt that scratch project. 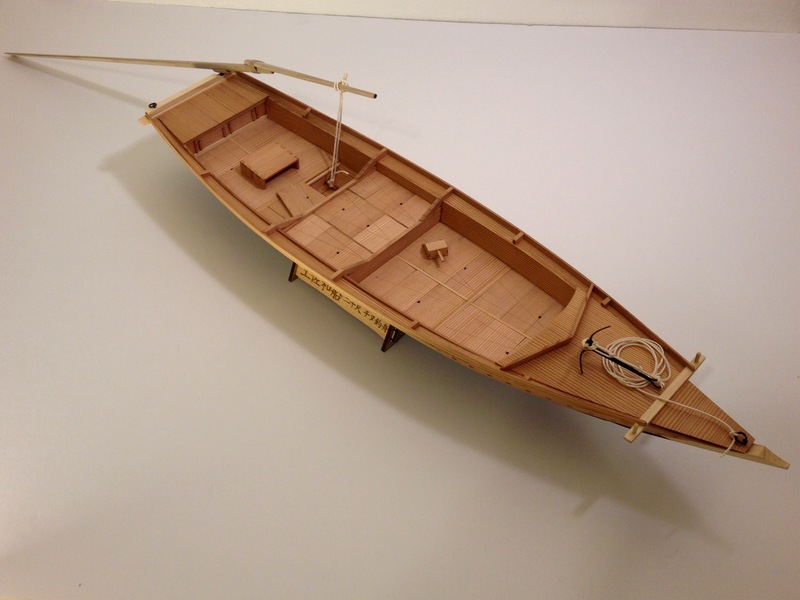 This entry was posted in Kit Reviews, Ship Model Build Logs, Ship Modeling News, Tosa Traditional Japanese Boat and tagged Japanese Boat Models, Thermal Studios, Tosa, Traditional Japanese Boat Building, Wasen on November 30, 2015 by catopower. A couple weeks ago, I was checking Facebook posts and I saw one from my friend Morikawa-san who runs the Japanese online hobby shop Zootoyz. 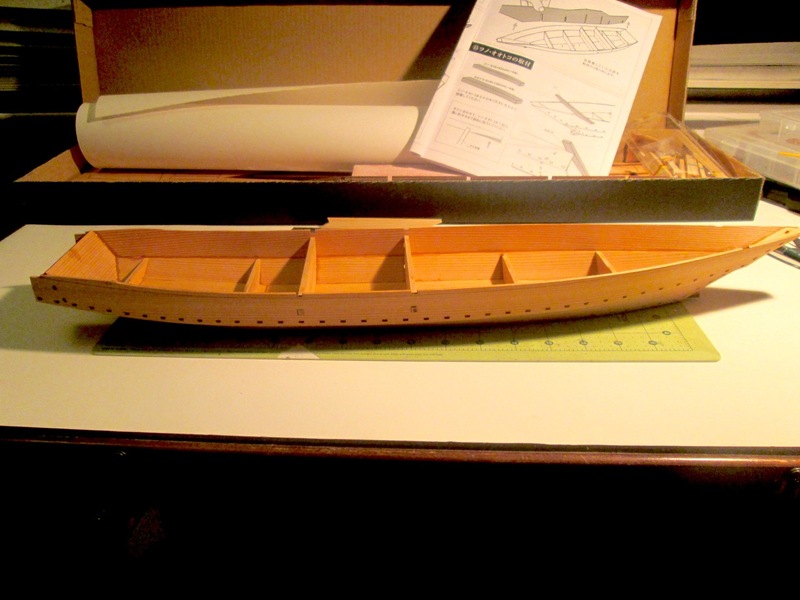 He’d posted a Japanese build log that I’d seen quite some time ago regarding the building of a large-scale model of a work boat from the area of Tosa, Japan. When I first ran across the blog, I searched for the kit’s manufacturer, but noted that they no longer produce the kit. It was 6 months to a year ago when I first learned about the kit, so when I saw Morikawa-san post a link to the same blog, I was hopeful that I had gotten mixed up before and that the kit was still in production. Looking around the Internet again, I found no indication that it was in production. But, thinking about it some more, I remembered that I’d found an out of production wooden Japanese ship model kit on Amazon-Japan before. So, I went to Amazon.co.jp, and used my familiarity with the American site to stumble my way around the Japanese site. Going back to the posts about the kit, I found the text for the name ”土佐和船” and did a little copy/paste into the search field… And there it was! Available, yet! Well, at least there was one available. Turns out it really is still out of production, but here was an old stock kit for not a whole lot more than the original pricing. Instead of the 13,650円 as originally marked, it cost me about 17,000円, which is about $140. I think if it had been listed by someone on the US Amazon.com site, they would have asked twice that amount, so I was happy to pay the $140. There was one hitch. The kit only ships within Japan. But, I’d dealt with that before by enlisting the help of a friend in Japan to serve as a kind of a shipping agent. I had the kit sent to him and he shipped it to me. Shipping has been all happening very quickly, but I won’t receive the kit until Friday or Saturday this week. I’m really excited about this find. 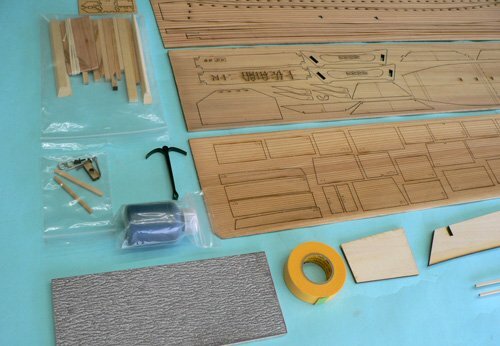 Morikawa-san has looked into the possibility of carrying this kit, but the manufacturer, a glider manufacturer called “Thermal Studio” lists it as “out of stock”. 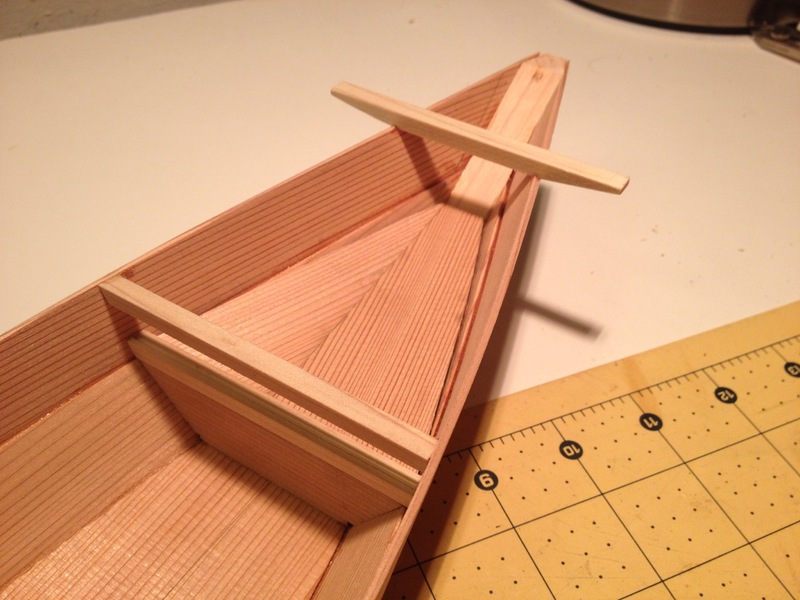 Now, why a maker of glider kits would make a traditional Japanese boat kit, I have no idea. I suspect it has something to do with the company’s close proximity to Tosa and the existence of a Tosa Traditional Japanese Boat Society. I’m hoping he’ll be able to convince the manufacturer to produce the kit again. I’d love to be able to write up a magazine article on this one as it looks nicely detailed, very authentic, and at 1/10-scale, it’s just about 2 feet long – a nice size. 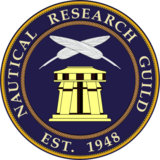 In any case, I’m planning on starting a build log on Model Ship World, and with the NRG conference in San Diego next Fall and the possibility of Douglas Brooks doing another talk on Japanese traditional boats, this should fit in quite well there. Not to mention the fact that it will greatly enhance my Wasen Display in Japantown, San Francisco. 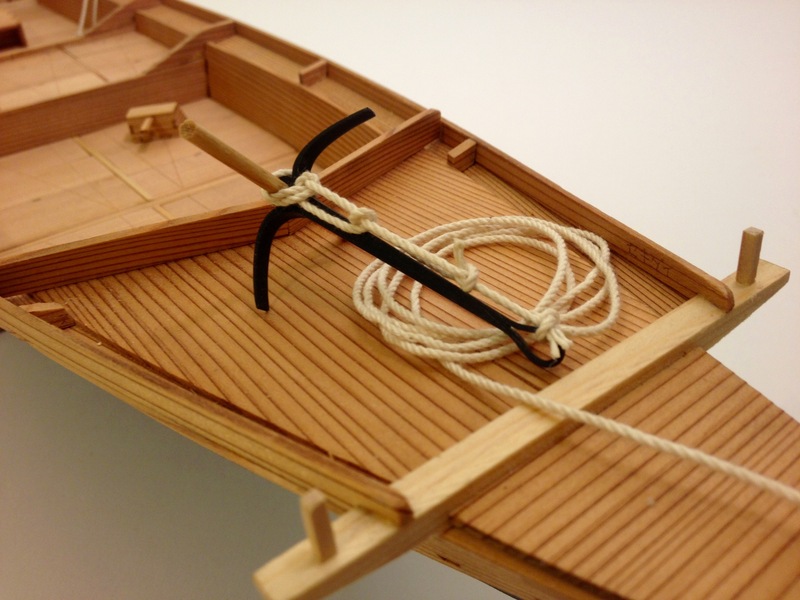 But, one of the things I’m really looking forward to is how it may help me further my understand of traditional Japanese boats given that this kit appears to be extremely authentic – more so than most of the Woody Joe kits in detail. 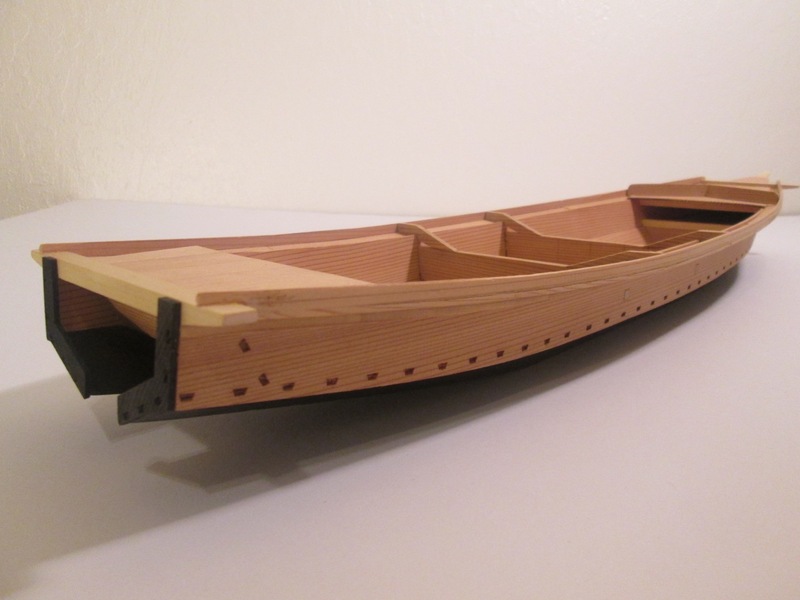 Also, I’m interested because I’m doing the preliminary work for scratch building an Urayasu Bekabune, one of the boat documented by Douglas Brooks during his Japanese boatbuilding apprenticeships. While this is a much different boat, I see some design elements that may help me figure things out on the scratch project. Finally, given the rarity of this kit, I’m probably not going to build it directly. Rather, I’m probably going to use it as a pattern to try scratch building a model from. Just from looking at the build logs and photos of the contents, I can see that this kit has some interesting design elements that I’m interested in. 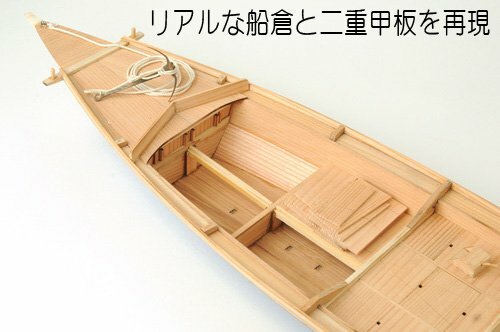 For one thing, I believe this kit may be of a style that actual traditional Japanese boatbuilders would use to build models of their own work. 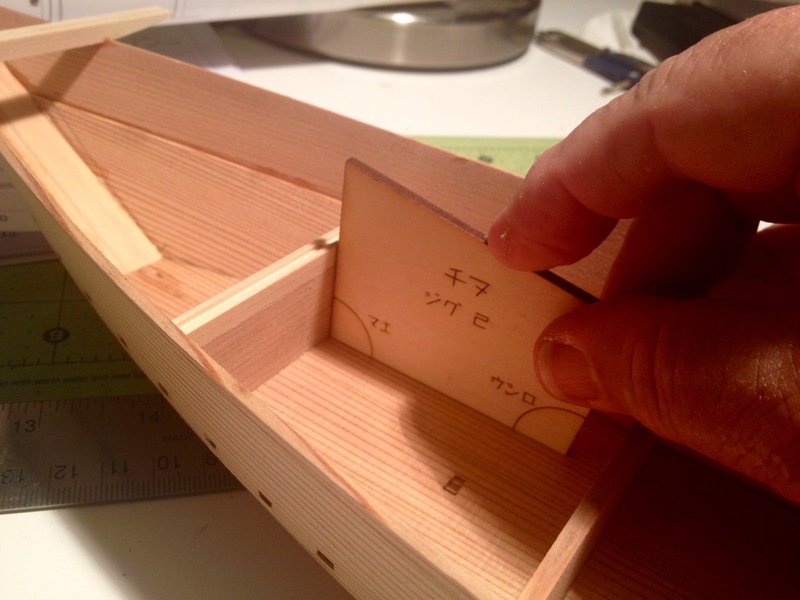 For one thing, the scale, 1/10, is the same scale that the boatbuilders used when creating their plan drawings (traditionally drawn on a wooden plank). 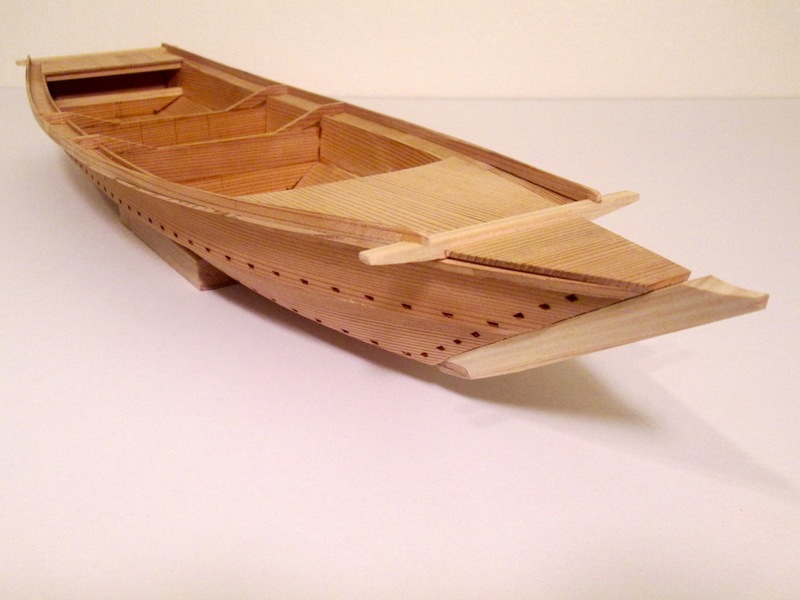 For another, from the photos, it appears that this kit might actually use the same kinds of woods used to build the actual boats. 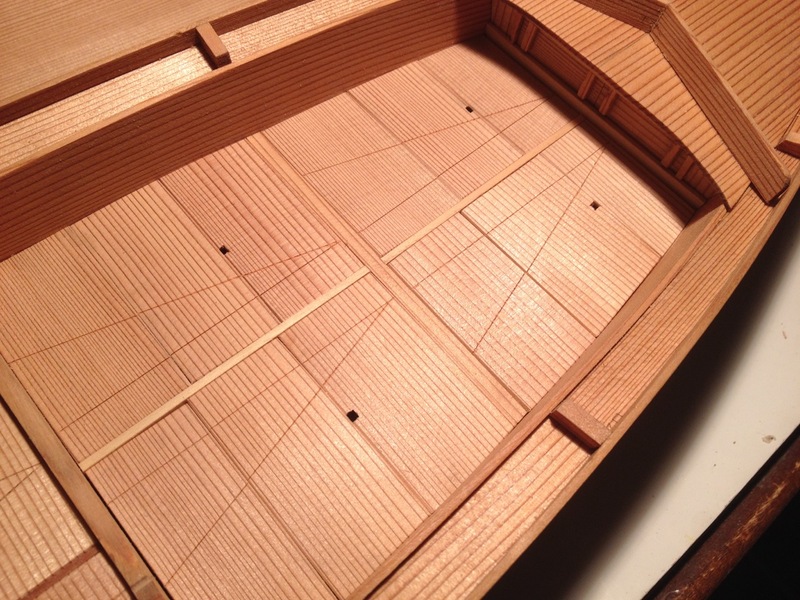 Specifically, it looks the the hull planks may actually be made from Sugi, or Japanese Cedar, while some parts like the stem and beams appear to be a lighter, creamier color, suggesting to me that they are made from Hinoki, or Japanese Cypress. 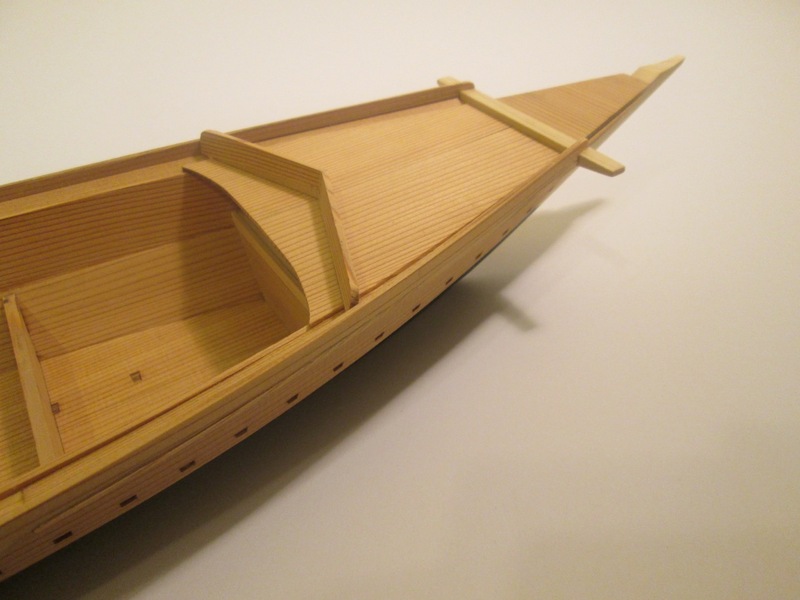 This entry was posted in Ship Model Build Logs, Ship Modeling News, Tosa Traditional Japanese Boat and tagged Japanese Boat Models, Tosa, Traditional Japanese Boat Building, Wasen on November 26, 2015 by catopower.